Transcript of oral history interview conducted in 1990 of Professor Leon Knopoff (1925-2011), internationally renowned scientist, professor of physics and geophysics, and research musicologist, at UCLA from 1950 to 2011. Known for his mathematical formulations of earthquake dynamics and for measuring seismic waves and gravity variations around the globe, he was noted also for his exceptional teaching and generous international collaboration. The 1964 representation theorem by Robert Burridge and Leon Knopoff is recognized as the first principle in modern seismology. Parents, childhood in Los Angeles, science vs music career. Attended LA City College and Caltech. Graduate student at Caltech. William Smythe, other Caltech professors. First academic post at Miami University, Ohio. Summer research position at UCLA Institute of Geophysics. Return to UCLA Inst. of Geophysics as Louis Slichter's postdoc. David Griggs. First important published papers 1954. Graduate students Adrian de Hoop, Anthony Gangi, Walter Pilant, Robert Fredricks, Joseph Hook, Edgar Kraut, Lawrence Porter. Gordon MacDonald. Freeman Gilbert. Knopoff's change of focus from theoretical seismology. The increasing divergence of geophysics and seismology from physics and mathematics. Joint appointments of UCLA Inst. of Geophysics faculty with other UCLA departments. Sabbatical leave in Cambridge, England,1960-61. Frank Press. Program of regional studies with long-period seismometers around the Alps and around the Mediterranean. The inverse problem of geophysics. Marriage to Joanne Van Cleef 1961. NSF Earth Science Panel 1959. The three major parts of Knopoff's career: theoretical seismology, surface waves, earthquake clustering and seismicity. George Kennedy and thermoluminescence. Archaeological expedition to Jordan and gravity profile of Dead Sea Rift. Recruitment to Caltech faculty and research at Caltech. Return to UCLA after one-year leave. Academic involvement in music. Sabbatical leave in Karlsruhe, Germany, 1966. Stephan Mueller, synthetic seismology. IUGG. Secretary General of Upper Mantle Project. Pembroke Hart. AFOSR, Vela Program. Soviet Union. Vladimir Keilis-Borok. Knopoff's father and uncle. Siege of Leningrad. Committee on Mathematical Geophysics. Soviet mathematicians. Historical and Soviet anti-Semitism. Continental drift, convection, V. Beloussov. Willard Libby, second director of UCLA Inst. of Geophysics. Fusion of UCLA Departments of Geophysics and of Geology into the Department of Earth and Space Sciences. New directions of the Inst. of Geophysics under Knopoff's directorship. Charles Kennel, William Schopf. Earthquake prediction: national program, Knopoff’s research and point of view. Linear vs non-linear processes, the hope that physics departments will become interested in these non-linear problems. I know that you were born in Los Angeles, California on July 1, 1925 but I don’t know anything else about your family or about your early life. Who were your parents and what did they do? My parents were Jewish immigrants from Russia. They were born in Russia? Yes, both immigrated to the United States before the First World War. My father, to escape service in the Czar’s army, arrived in 1914 and was promptly thrust into the middle of the war that erupted at that time (in 1917). They met in Los Angeles and were married in Los Angeles. My father was a carpenter and my mother had worked in a garment factory prior to her marriage. I was an only child. My parents were very protective and despite the depths of the Depression I was insulated strongly from that. My parents were not educated in a formal way. They were self-educated and extremely bright and intelligent people, I always thought. Both had strong musical interests. That is interesting, given your later work. My father sang, and my mother and father both played the mandolin. These are not very high-class instruments these days, but they found these modes of expression very strong. They were very anxious that their only child should have the educational opportunities that they never had, and my own childhood was one of great, I wouldn’t say pressure or anxiety, but I would say a great desire on their part that I should have great success in life. I was the focus of their future. I took piano lessons, as most children did. I started at the age of 9 1/2 on a piano. During the Depression the building trade industry collapsed. My father, always an enterprising man, decided that delivery of milk was supplying a commodity that people couldn’t be without. So in payment for a milk bill that one of his customers had, he took a piano in trade. That was the beginning of my piano lessons. I think it would have happened in any case, but the circumstances were a little bit strange. We want to be sure to record the exact names of your parents. My father was Max. My mother was Ray. Did you have a chance to do much reading about science when you were growing up? How old were you when that was happening? Oh, I don’t know. I don’t think anything was seriously discussed until I was 12 or 13 or so, and the reason is — that it arose about that age — that I started high school when I was 12 1/2 years old. I had been pushed along in the early grades. It was clear that I was going to take an academic career, and the regular academic career in the high schools included some courses in mathematics and chemistry, physics and algebra, and those things. Were you still living in Los Angeles? Yes, in East Los Angeles. Boyle Heights and City Terrace were the melting pot of the area and there were immigrants from all over the world, especially a large Jewish community. There was a large Hispanic community and a large Japanese community at the time. The Japanese community dispersed with the internments in the war. Now that part of the city is almost 100% Hispanic. I was pushed along strongly in music. I had some talent. And I was pushed along strongly in science. I think, since no one knew anything about physics or chemistry as a career at that time, engineering was vaguely discussed but nobody quite knew what engineering was. Somebody in the neighborhood said “Oh, there is a chap somewhere in the neighborhood and he is an engineer and he builds bridges,” so I guess the original direction was engineering. I couldn’t afford to go off to a live-away college so I enrolled in Los Angeles City College, which was a junior college, in an engineering program. This was as soon as you graduated? This was as soon as I graduated in January or February of 1941. How old were you then at that time? 15 1/2. I could commute on the streetcar to City College. I took an engineering course. I had the opportunity to embark on a musical career at that point. We played it safe. There are an awful lot of talented musicians out there who never make the top grade. So, we decided that engineering was safe. I was playing piano. I’ve pursued those interests since then, as you know from your conversations with Katherine Vaughn, but they have gone in a rather different direction. I enrolled in a program that went toward Civil Engineering and I was content. I fell under the influence of my teacher of the first-year physics course, who had been a Caltech graduate, and he encouraged me to apply to Caltech for admission — his name was Ralph Winger. Were there any high school teachers that were particularly memorable? In the sense of a Mr. Chips relationship or a Mrs. Chips relationship that one would like to reflect on as being an extremely warm relationship that played a formative role, I would say no. Were there others that were thinking in terms of engineering? I really don’t think that played any role. I was really a chip on the water just being moved along by whatever stream happened to catch me, and I think that was largely true for a very long time. I applied for admission to Caltech. My original intention had been to go to Berkeley to finish my engineering career, because UCLA didn’t have an engineering program at that time. It had two years and then everyone went to Berkeley. My intention was to do two years at City College and go off to Berkeley. I applied for admission to the freshman class at Caltech. I had graduated from high school in the off-year. When you were applying to Caltech were you thinking more towards the sciences? Still engineering. I was interviewed and I told the interviewer that I couldn’t go unless I had financial support, and I didn’t get admitted. I applied again in the sophomore year for admission, and I then had laid aside a little money from summer work. The war was then on and I was too young. I had worked in the summer and put aside enough money for one year of tuition. Tuition was then $300 a year, if you can believe such a sum in today’s astronomical figures. I went to Caltech. I traveled to Caltech on the streetcar from our home in East Los Angeles. I did well. Caltech had a V-12 program. Most of the regular students had been drafted, and the Navy had a training program on the campuses of a number of universities. Caltech had a Navy program; I think there were Army programs and other programs elsewhere. Many of the same students who had been undergraduates, civilian undergraduates, had been drafted and placed right back in the Caltech program. There were students from other places — Stanford and so forth. I was a civilian student, mainly because I was too young, and I graduated in 1944. They had an accelerated program. This was when the University was running twelve months out of the year, wasn’t it? It was a year-round program. There were no summer vacations or anything like that. Do you remember any contacts with particular faculty during the first years that you were at Caltech? I guess the curriculum was fairly rigid at that time. The curriculum was rigid. One remembers taking courses from particular individuals. I don’t think that they had a significant formative influence. I remember seeing demonstration lectures by Robert [A.] Millikan, who taught the sophomore physics course or at least gave the demonstrations for the sophomore physics course. About the middle — I’ll come back to that in a moment if I might — of my career at the junior level, I discovered there was a pecking order among engineering students and that the civil engineers were at the bottom of the heap. At the top of the heap were the electrical engineers, who looked down on the mechanicals and so on beneath them. So I switched purely for snob reasons. I switched to electrical engineering because it was more challenging. They were doing harder problems. By the time I became a senior in electrical engineering, mainly through the influence of a close friend of mine, I was persuaded that physics was even much more sophisticated and much more difficult and challenging than electrical engineering. So by the time I was a senior, I knew that I was going to major in physics in graduate school. I was going to complete what I had done then. I took the advanced electricity and magnetism course from Professor [William R.] Smythe, who was considered to be a very demanding and austere teacher. It turned out he was not austere at all, but I consider my interaction with him as probably the most inspirational of my entire undergraduate career, because everything he gave me was difficult. It was hard to do. Everything up to that point had been easy. I could do all of the problems without ever reading the text and suddenly I came face to face with a challenge. I must admit, no problems were being generated by me. I was not a generator of problems. I was just an absorber. I always have loved puzzles and I like somebody putting something down and saying “Here, can you attack this?” It was a difficult puzzle to do classical E & M. That was fun. That was good. That is how Smythe had set up these things? It was a problem-solving course. He had written a book which was in much use in his course. Smythe’s course was considered to be a very challenging thing, at least for me. I really enjoyed the advanced undergraduate physics and this was a revelation to me — that problems could be so interesting and challenging. It was far more interesting than electrical engineering. I changed to physics as a graduate student. Did you talk with Smythe about your graduate plans, or any others? I was mainly a product of peer pressure more than anything, than instructor suggestion. My directions depended on who my cohorts were and what their interests were and that sort of steered me. So you wanted to go immediately into graduate work as soon as you finished your undergraduate? Yes. What was difficult about Smythe’s course, for me, was the other work had always been so easy that I could absorb everything I had to know just by listening to the instructor give his lectures. I never had to read the book. The only reason I opened the book was to see what the problems were at the end of the chapter. I suddenly had to learn how to read seriously, for content, in my senior year as an undergraduate. I’d never really done that. I have never been a great success as an eye person. I am a good ear person. My attention wanders when I read something that is difficult. I discovered that in Smythe’s course. I had difficulty with the course because I had to read and understand, and pay attention. I gather most of your contact with Smythe was during the school day? You didn’t have many other contacts? No. There wasn’t much going on in graduate physics until the war ended. I had been called but found physically inadequate. I had a knee problem that I was in and out of hospitals for from the age of 12 until the age of 21. I had the problem cleared up with surgery in 1946. Those were nine difficult years and difficult for my parents, too, with the medical problem. Nothing much was doing at Caltech in the graduate program until the war ended, and then there was a large return of students. The program began in earnest and we started to work. My father died in 1946 of a heart attack at the age of 51. My mother went back to work in a garment factory. I was supported out of teaching assistantships. It was a difficult time. She was a very sacrificing woman, but it all worked out. I did my Ph.D. under William [H.] Pickering who later became the Director of the Jet Propulsion Laboratory and became very prominent in the space program. What special interest did you have in the department as you became a graduate student? One found a greater involvement with personality of famous men when one was surrounded by famous men. [Richard C.] Tolman was there? Tolman, Nobel Prize winners like Carl [D.] Anderson and Robert Millikan, who was in his later years already then. Some of my colleagues were graduate students of these famous people. We all loved getting lectures from Professor Paul [S.] Epstein, because he was such a transparent lecturer. He could make difficult physics clear. So was Tolman. Tolman was folksy, though. Epstein was very formal. Everyone loved him and couldn’t get close to him. There was a deep gulf between the European professor and the American graduate students. We all knew that Fritz Zwicky was a curmudgeon in the classroom so everyone tried to stay away from his course. We all took our analytical mechanics from Leverett Davis [Leverett G. Davis, Jr.], instead. Zwicky taught it the first year and then we all waited a year and took our mechanics from Leverett Davis, because everyone was somewhat cowed by the reputation that Zwicky had about his student relationships. Whether they are true or not, I don’t know. Did he have many graduate students? I don’t know. My impression is that the graduate students gravitated to the experimentalists, went to (among my cohort) work with Jesse [W. M.] DuMond and Carl Anderson. I worked on a problem with Pickering on the interference of frequency modulated waves. As things turned out I don’t think it was a particularly world-shaking problem. It wasn’t awfully important. In fact, electromagnetic theory was on the decline as a major force in physics. Was that something that Pickering had recommended? It was something that… FM was just on the ascendancy and there were problems of the detection of FM in the canyons, non-line-of-sight detection. It was a problem and we were able to do some experimental work. I was able to develop a little theory. But along about 1948, I sort of ran out of enthusiasm and money. I left Caltech and essentially said I would write up what I had and if it was acceptable that would be fine and if it wasn’t fine I would take that chance. Do you recall what led to that disillusionment? I think it was just that I had been going continuously for seven or eight years. I looked for a job and there was an announcement that I got, actually again through one of my friends. They were looking on a very short time constant, very short notice, sort of June-ish. I heard that Miami University in Oxford, Ohio, was looking for an assistant professor of physics because, as I later learned, the person they had lined up for the job had left them in the lurch. I went off to Ohio. I agreed to come in September, not knowing anything. I had never been out of the state up to that point in 1948. I hopped into the car that I had inherited from my father and drove. Did you know much at all about the department? Absolutely nothing. Several of my fellow students had been graduates of Miami University, and they kept telling me that it was a school that had a very, very high acceptance rate into graduate programs for their undergraduate degree students and probably ranked among the top two or three in the country in terms of schools that didn’t have a graduate program, in terms of their advancement to a Ph.D. That was a good mark for Miami, so off I went. That must have been quite an experience. I didn’t realize how different the Midwest, the border with the south — it is in the southwestern corner of the state — was from Los Angeles. I found that I really didn’t like that part of rural Ohio. It wasn’t just that it was rural. I didn’t appreciate… I had been brought up in an extremely strong environment of liberality, of tolerance. My father was very vigorous in the left-wing labor movement. When I arrived I found prejudice. And, it was disturbing to me as a young person. I didn’t know how to handle it. Was it because of your Jewish background? Of course, I didn’t know quite what to make of this. I am also an extremely stubborn person and not very flexible. Of course, if anything is calculated to make me firmer in my resolve, that was it. I never had any resolve in that direction. It never occurred to me that such a thing was possible. I must admit that I flirted with “How would I go through life if my name were some nice Anglo-Saxon name that began with ‘K’ or something like this. Suppose I were Knight or King instead of what I’ve got?” That was a symptom of — I didn’t spend my 24 hours a day for nine months of the year at Miami worrying about these things. I had other things to do. I had to teach classes and interact with the students. I would go into Cincinnati, where I had distant cousins, and I found that they were prejudiced against blacks, which was an idea that never had occurred to me. I had been that insulated. I knew you could read about it in the newspapers. But it wasn’t something that you had experience with? To have something in my own family — they were very distant cousins — but to have something like that in my own family, it was because they had been brought up on the Kentucky side of the Ohio River, right across from Cincinnati. I was disturbed by it. In any case, I found all sorts of reasons. I didn’t like the winter, but basically I early made up my mind to leave. Did you have interactions with others on the faculty where this became an issue? No, as a matter of fact I think that the faculty was quite the opposite. The people I interacted with were very, very free-minded, liberal. I did play handball with the director of admissions and he told me that, although Miami was a state university, they had a quota on admissions from New York City. New York City being an area with a high Jewish population? Of course. He made that as a statement of fact, not a statement of personal opinion. I never did find out if that was something he felt or if that was the policy that had come onto to him from above. I never explored these things. I completed the write-up of my dissertation, submitted it to Caltech, returned to Caltech in the late spring of 1949, picked up my degree and decided for the first time in my life I was going to have a summer vacation and be a beach bum, and go every day to the beach at Santa Monica; and return for the next year to Miami (as I had no alternatives). One evening in the middle of the summer I got a phone call from a person who said — it was a Friday evening as I recall in the early summer, and I literally had been getting sort of bored with going every day to the beach. I was late to go out on a date, taking a girl out on a Friday evening, but the phone rang and this voice on the other end asked if I was Leon Knopoff and I said “Yes” and he said “This is Professor…” and I didn’t quite catch the name. He started speaking rapidly and he understood from faculty at Caltech that I was not doing anything that summer. I had gone back to Caltech to see my colleagues and to drop in on my teachers on the faculty, especially Smythe, whom I adored, and Pickering. He said that he was a professor at UCLA and he had a small experimental problem using geophysics. He had a small experimental problem that he thought could be attacked for six weeks or so in the summer and was I interested? Money wasn’t the issue, it was just getting out of that boredom of swimming every day and sunning myself. I was doing a lot of reading, but, as I told you, I am not a very good reader of technical literature. I can read pulp literature as well as anybody. So I said, “OK I’ll come down,” and he started to explain the problem. I said, “Look, I’m not quite getting all of this” as he was speaking very rapidly, so I asked if I could come in tomorrow. Tomorrow was Saturday. He said, “Well, nobody’s around here on Saturday,” so I said, “All right, I’ll come in on Monday.” He said, “That’s very good, but I won’t be here. I’m leaving in half an hour for Canada and won’t be back for six weeks. But you go in and talk to” so-and-so and so-and-so. He gave me three names that I rapidly scribbled down. These were all people you had not heard of before? It turned out that two of them were graduate students and one was an undergraduate assistant of Professor Louis [B.] Slichter, who that had been on the phone. They didn’t quite know what he had in mind because he hadn’t really told them. But I started to — and the idea was to just put transducers on a piece of solid material and see if you could get sound waves transmitted through there and look at transients, rather than looking at some sort of steady state vibration problem. The idea was to construct a seismic model as an analog simulation of what the exploration geophysics people do when they shoot off explosions in the Earth’s crust. And to bring it into the laboratory. This was a laboratory thing so I learned about transducers and I learned about coupling them to solids. I went in every day with absolutely no supervision at all. How did you find out about the nature of the project? They knew the title of the work and this seemed to be, to have developed, at least that much out of it. I said the best I could do was take a rod of metal and see if I could put a — I discovered the beauty of barium titanate, which was at that time an electrostrictive material that had just come on the market. In fact, I even thought about firing up some ceramic and making barium titanate transducers — I later did. I was able to get some sound waves. They were awfully undamped and awfully wiggly. It didn’t look at all like things you see in the Earth which are heavily damped. Did you already read then, during that time, some of the work that the exploration geophysicists were producing? No, I didn’t read that. I was reading more the physics literature on acoustics and trying to see how they were attacking the problem that way. In any case, this was only for the summer and I was more interested in fiddling in the lab, just putting things together and seeing what they could do. I am just curious, is that something you were able to do under Pickering as well? How was he as a dissertation advisor? Bill was already very, very much involved in, and getting more and more involved in, the proceedings of JPL. He was very little around the campus at that time. I was left pretty much to my own devices. Bill could get the equipment available to me but I wasn’t getting much direction from him because he had his own agenda to develop. You were quite used to that way of working on your own? Yes. As it turned out I wasn’t very good as an experimentalist. I was sort of “all-thumbs” usually. I made a lot of mistakes along the way. It was a learning process, too. In any case, I remember that the faculty at the Institute of Geophysics was four people: Slichter, [David T.] Griggs, Clarence [E.] Palmer, and Robert [E.] Holzer. Palmer was a tropical meteorologist, Holzer did atmospheric electricity and magnetism, Griggs did high pressure physics, and Slichter did everything in the solid Earth. Were Palmer and Holzer also at UCLA? They were all here. We lived, at that time, in a set of temporary barracks buildings, which is presently the site of Knudsen Hall — the physics building — on this campus. The shacks were on dirt level. The dust would drift in over the threshold. I remember Palmer, who had a very sharp sense of humor. He would tell you stern things with a twinkle in his eye, which I hadn’t quite read, because I didn’t interact much with meteorologists. He came in a few days before Slichter was due to arrive and asked, “Well, what have you been doing?” I told him and he said, “You better watch out when Professor Slichter arrives,” and so I dreaded this experience when this critical review by Zeus was about to descend upon me. When the day came and in walked this extremely gentle and jovial, sparkling man, it was — well whatever I told him, he loved. He was so pleased with what I had done. I don’t think even to this day I had done anything remarkable, but he was in the mood to be pleased, and I think that was largely his own personality for as long as I knew him. He then invited me to continue. I could stay as long as I wanted. Was this with a firm appointment? It would be as a postdoctoral position. I was already morally committed to return to Miami, even though my predecessor didn’t feel that same moral obligation. You recall that I had gone there as a last-minute replacement for somebody who had quit. Anyhow, I went back to Miami. In mid-winter I wrote Slichter and asked if his offer still held and he said “Yes,” and by that time I had a salary of $4,800 for nine months at Miami. You were already associate professor at that time? Yes, they pushed me ahead with an advance in title and an advance in salary — 20%. They wanted to keep you? Yes, and I came to UCLA at a lower rate per month — $5,400 but now for an 11-month appointment — and I came back to UCLA. I have been here almost ever since. Let me ask you a few things about that summer you were interacting with the people. Was this before [George C.] Kennedy had arrived? Yes. We can talk about that. I am curious just what you recall in your conversations with people. The Institute had just formed? The Institute had formed in 1946. Right. Do you recall conversations about what the aims of these people were within the Institute? Did you get a feeling for the kind of geophysical problems that the people had pondered over? One of the questions I asked Louis — which was sort of a brash affront — about coming to UCLA is “What is geophysics and is there a future in it?” I knew absolutely nothing about it. With the usual twinkle in his eye he said “Well, some of us think that there is a future in geophysics.” It turned out that most of the people in geophysics… geophysics at the time didn’t exist as a discipline. It was sort of the interface between physics and chemistry and mathematics and meteorology. Of course, we had these two important atmospheric scientists on our staff. The University had been sold the idea by a distinguished committee that geophysics was a discipline of great promise for the future, and the University had organized this Institute of Geophysics. Do you recall who was on that committee? Later of the USGS, but he had been the chair of the Department of Geology here at UCLA. Is that right? At that time? Yes. Hans [U.] Sverdrup, the oceanographer. At that time U.C. San Diego didn’t exist but Scripps existed as part of the University of California, and it was formally attached to UCLA for administrative purposes. Jakob [A. B.] Bjerknes, who was Professor of Meteorology here, Joe [Joseph] Kaplan, who was Professor of Physics here, and there may have been one or two others whose names I don’t have, because I was not in on that part of the process. They recommended to President Robert Gordon Sproul that an institute be formed — these are gleaned from learnings much later — and Sproul formed an institute and endowed it with ladder faculty positions. At that time it was a small number but it clearly had four people by 1949. What do you mean by ladder faculty? Well, members of the Academic Senate, people who had or can achieve tenure. That would move into the permanent positions? That are permanent members at the full professorial level. They are permanent members of the university faculty but the rule of the game at the University of California is that institutes are forbidden to offer academic degree programs. They cannot have students, they can’t offer degrees at any level — bachelor’s or doctoral — and the degrees are offered in departments. They are the people who have curricula, they are the people who have the students, they are the people that in fact have the leverage to grow. This was a research organization. It turns out that in the University there are several channels — budgetary channels — of which one is instruction and research, which is the main part of the University, and the other is a research channel. There were certain organized research units that had faculty assigned to them. But the faculty had no teaching obligations because they were not associated with degrees. They had no students, so these were research professorships in the Germanic sense. This is what I was going to ask. Do you think that was one of the models that people like Sproul used? I don’t know. I can’t tell you what was going on in President Sproul’s name. I was curious if you heard discussions. I never heard that. I don’t know anything about that. But you are quite right that that does seem to follow the German pattern. Right. And, to a certain extent over the years, this was a source of envy on the part of regular faculty members at UCLA toward the Institute of Geophysics — toward those members of the Institute of Geophysics. Here were people who could spend all their time on research, whereas they had to spend a significant fraction of their time teaching both undergraduates and graduate students. Everybody wants to be a famous research scientist. Louis Slichter was the Director and his job was a difficult one, to maintain the standards of the Institute so that they were unassailable by appointing really important people so that, in fact, you could say yes there was a class structure, a class division, that these people were “better” than the others. That may or may not have been true. But nevertheless it was a serious source of friction within the University. I think it still continues to this day. Was the competition seen particularly between the Institute and those in the geological sciences or was it more broadly defined? I think over the years it was seen within the sciences. I think the geologists felt the competition more strongly than anyone else. There are others more remote in the University — in foreign languages or in the social sciences or something — who are aware of the existence of this unique organization because they sit on university committees and they say, “Why can’t we have that sort of thing?” In any case, I came as Louis’s postdoc in 1950 — without summer vacation! — and started to work on the seismic modeling. I really wasn’t a good experimentalist and didn’t want to be. I was Louis’s postdoc for seven years. That is a long stretch. That seven years was probably the most valuable part of my formative experience because I learned geophysics. I looked around. I’ve always in my entire career somewhat patterned on Louis in part, namely, “Could I find problems that no one else was doing?” It wasn’t a matter of finding problems that somebody else was doing but I could do it better, but could I find areas of science that no one else was doing at all, and could I explore that area until other people discovered it, and then when they got in I would get out and go off and do something else. I just have never really liked competition. I don’t want to. Was that something that Louis Slichter had experienced? When I wrote Louis’s biography after his death, I studied his central contributions and found that — I wasn’t aware of this — his scientific publication list was really very short. But if you look at the publication list, it consists of between six and twelve — there are many more than twelve papers — papers that are the first paper in a field. Now, for someone to identify six or eight — or whatever the number is — major fields, this is a major accomplishment. And he wrote only one paper in some of these fields. He never wrote anything else. It is an unusual achievement. He wrote the first paper on the evolution of the thermal history of the earth. He did the first work on using explosions to do crustal seismology. He never published it, as a matter of fact. Tuve and Tatel [Merle A. Tuve and Howard E. Tatel] published on that. I’ll give you a copy of my biography of Louis [for the Royal Astronomical Society]. No, I am embarrassed about that. I have to still write that for the Academy. But, I did write up a memoir for the Seismological Society of America, which I can give you. [Note: The biographical memoir of Louis Slichter for the National Academy of Sciences by Leon Knopoff and Charles P. Slichter was published in 2004 (22pp).] In any case, I went to work and I became interested in the theory of elastic wave propagation, and since I had this strong background in electromagnetic theory I asked, “Since seismic studies are really wave propagation studies, can’t I approach the problems of seismic wave studies or elastic wave propagation from the same point of view as physical optics, which had already been developed from electromagnetic theory?” I had the whole idea that I would look at scattering, look at diffraction studies, look at this whole area of seismic wave theory. I discovered it was an open field. Really very little had been done. Except for a brief note in 1952, I hadn’t had a single publication in four years. It was really a learning experience? It was a learning experience for me. Louis’s secretary, who was on my side, used to come to me and say, “You ought to be writing something. Can’t you write something for publication?” I said I didn’t have anything; I wasn’t ready. I don’t want to pull you off this path if you want to continue it, but when you went into thermal evolution of the Earth — studies that Slichter was in — that was an important time. The Rancho Santa Fe Conference, for example, occurred in 1950. That came later but that was one of his efforts. He had written a paper on trying to understand by convection, how on Earth… how the temperatures at the surface and in the interior would change over time. It was a landmark paper. It is not used much these days but it certainly was then. At the time it was widely regarded by many people. Yes, but the Rancho Santa Fe Conference is another example of Louis’s skills. What he did was organize the Rancho Santa Fe Conference by inviting all these great men and let them brainstorm. The output of that conference was that convection is a model for evolution; that was likely to be the key. Did I show you Dave Griggs in this photograph? We are looking at a photograph now of the Rancho Santa Fe Conference. Convection turned out, as a paradigm, to be the principal conclusion of the meeting. That meeting had, in part, been stimulated by Harold [C.] Urey’s research on the structure of the Earth’s interior. I wasn’t aware of that. Convection was not widely accepted in some circles. Did you have colloquia regularly at the Institute? How did you get a chance to talk about what the different people at the Institute — within the Institute — were working on? We didn’t have colloquia as I recall. I mainly just wandered, occasionally. You’d just be able to go to others’ offices? Yes. To get back, the other great formative influence on my career was Dave Griggs. He had the lab next door. He had a machine shop and a postdoc and maybe a graduate student or something like that. I discovered his extraordinary value as a critic. Dave had been trained as a physicist at Harvard with P. W. Bridgman. He had been a Junior Fellow at Harvard and the rules of the Junior Fellows were that the Fellowship was so wonderful that you never really needed the Ph.D.! So, he never finished the Ph.D. I think that’s later gone by the boards. It is pretty hard to show that on your CV. Anyhow, Dave never got the Ph.D. but he was a superb experimentalist. Not only was he a superb experimentalist, he always understood why one wanted to do the experiment, which was as important as actually doing the experiment. He could do these experiments at high pressures and high temperatures. He was doing experiments on the rheology of rocks but he knew physics, and he could act as a critic. I had the model laboratory here, and the other half of the same Shack — only two halves — was his, and I would just walk around onto the dirt into his door and start sketching at the blackboard what I had concluded. And he would demolish it! Defeated I would retreat, go back and scribble some more; sometime later come back and the process was repeated. After some extended period, Dave would say, “You know, I think you are right.” With that laurel, with that tribute, I would go off and I’d write it up and publish it. In 1954 I started getting some important papers out. The first few papers were really pretty good. I wrote a paper on the diffraction of elastic waves, which I put into the Acoustical Society. I think that was the first good one that I was reasonably pleased with. In 1955 the theory had developed enough momentum that Louis Slichter — I was still his postdoc — went off to a different project. He’d pulled together a consortium of petroleum companies and they each put — I forget what it was — $4,000 or $5,000 each per year; there were twelve of them. Actually there were eleven plus the United Geophysical Company, which was a minerals exploration firm. They were to support what was called the Seismic Scattering Project at UCLA and I was the chief investigator. Louis was the entrepreneur because I didn’t have any faculty standing. Did you talk with him during the time when this idea was coming together? Not really. I showed him what I did and he appreciated it. I think he saw how it might evolve. He was a remarkable, self-sacrificing man. He went out and did these things for me, and he never injected that he wanted to use this to support his own research, which was going on at this time. It was something that we could deliver. He went out and found a young graduate student. In Louis’s travels through Europe, he found a young graduate student at Delft by the name of Adrian [Adrianus] de Hoop. Adrian came here and spent a year. Basically he worked with me. As an outgrowth of my ability to sketch problems on the blackboard, Adrian developed a technique. It was really an extraordinary insight in “how to.” He found a solution. He used some of the things that had gone on in the electromagnetic theory. We talked about diffraction. He developed the technique which he later submitted as his Ph.D. thesis at Delft. That method is now taught as a standard procedure in graduate courses in seismic theory. It is called the Cagniard-de Hoop technique. I wouldn’t have known about Adrian if Louis hadn’t brought him here for just one year. We were still in our non-academic classroom role. So, I had six graduate students. That was quite a proportion. I think there were only about twelve graduate students in the Institute? That may be. Recognize — I forget the precise sum — that $50,000-$60,000 a year is a respectable sum in 1956-57 dollars. We supported six graduate students out of it. We bought a state-of-the-art computer for our own use — a Bendix G-15 computer. It’s almost as big as two of those filing cabinets behind you. That computer could do about as much as your little HP calculator can do today. It was state-of-the-art! We were the first to have a digitizing system for digitizing seismograms. So you always felt you had state-of-the-art equipment? In those days, yes. We were just doing things just a step ahead of anybody else. By 1955 or 1956, George Kennedy had been brought here. I’d like to talk about Kennedy in a moment. What work did those graduate students that were under you get into after they did their thesis work? Of those six, two are in academic life; one is a professor at Texas A & M, the other a professor at Pittsburgh — Tony Gangi [Anthony F. Gangi] and Walter [L.] Pilant. One became a very important name in aerospace in magnetospheric studies associated with our space research program — Bob Fredricks [Robert W. Fredricks]. Joe Hook [Joseph F. Hook] had been a V-12 student at Caltech and I knew him from our undergraduate days. He had come to UCLA as a research student on the cyclotron, had become disaffected with the long queue you had to go through to get the Ph.D. and he had gone to work for the Aerospace Corporation. He came back to me and said, “This is an unfulfilled goal of my own.” Since we had been personal acquaintances I really couldn’t do anything except welcome him. I did. He is a very bright man. He went back to Aerospace Corporation afterward. The other two, Ed Kraut [Edgar A. Kraut] is a research scientist at Rockwell International Science Center up in Thousand Oaks and did some very nice things on surface waves as delay lines. The sixth, Larry Porter [Lawrence D. Porter] has sort of moved from job to job, doing good things, never really settling down, but has always had a job. He was with Brooklyn Polytechnic for a while; Northern Illinois University for a while, then with Sohio, and now he’s with Bechtel, and there are probably a few others in between. I think he was with the State of California for a while. He is a seismologist and hard-working fellow. During those early years that you were at the Institute, did you or any of the other staff have much contact with members of the Geology Department? Was there much interaction between the groups? Not really; as far as I was concerned, there was not. In the mid-1950s the first wing of this building was built and then we moved out of the shacks, and the Geology Department moved out of their quarters in one of the old buildings on the campus. We all moved into this building. Not the one called Slichter Hall? No. This is called the Geology Building. You are at this moment in the Geology Building. Slichter Hall was built in the 1960s. With some provocation I could find the dedication date . It was built with NASA money to house the space activities that had become a major part of the work of the Institute. Bill Libby [Willard F. Libby], who was the second Director, had developed that money with NASA. That building, in fact, is the connecting wing between Geology and Chemistry. It is just that one section. You may have seen that facade as you entered this building. The Institute’s quarters are both in this Geology wing and in Slichter Hall, which has the words “Space Science” underneath its name, I think, or “Space Physics” or something like that. In 1955 George Kennedy came as the fifth member of the faculty. There are just a few other questions I’d like to ask about the late 1940s and early 1950s. You know that M. King Hubbert was trying to reform the curricula of American universities for geophysics, as a member of various committees addressing this issue. Were you aware of that at the time? Absolutely not. Actually I was learning the field, and I was as important in the field as an undergraduate would be because I was just learning. I was not a political force at all. I had no interest in the broad-scale academic growth of the discipline. I was just — I had no family responsibilities, I had no… except to amuse myself learning a field. I was really non-interactive. Did you have much contact with Gutenberg [Beno Gutenberg] and the people at Caltech during the early 1950s? No. The answer is no. Gutenberg and Byerly [Perry Byerly] had divided up the State in terms of the observation of earthquakes. Gutenberg was President of that group at the time, wasn’t he? Yes, I think they all had been President. It is a rapidly rotating presidency; like the APS [American Physical Society]. You could see famous names: Gutenberg, Byerly, Maurice Ewing [W. Maurice Ewing], Hugo Benioff [V. Hugo Benioff]. They would all sit in the front row. I want to get back to my own career. By 1956 my work was getting to be at least recognized. I was invited to go to — I may have the chronology wrong by one year or so — give a seminar at MIT. I went there and I met a young man who had just got his Ph.D. He was my junior by a few years. It was clear that he was an extraordinarily smart man. He was thinking about the same problems that I was. His name was Gordon [J. F.] MacDonald. I had been working on attenuation, and I was convinced that the experimental observations of attenuation could only be explained by nonlinear processes. He was trying his very best to explain them by linear methods and I think I persuaded him just during that visit. I came back and I told Louis about this extremely smart man who had been a member — how George Kennedy and Gordon MacDonald and Dave Griggs were all members — of the Society of Fellows at Harvard. I told Louis about this extremely bright man and all this excitement. The upshot was, with great apologies to me, Louis Slichter brought Gordon MacDonald to join the faculty. I was going to be put on the shelf. I was the next candidate for an appointment and, in fact, it was a recruiting exercise at MIT. You felt assured, in other words, this would turn out? I had enough self-confidence. The title didn’t disturb me at all. Gordon came and it was a good time for us. We worked on several things together. He introduced me to the problems of the physics and chemistry of the Earth’s interior, about which I had thought almost not at all. He had superb thermodynamics skills. You earlier published with Robert [J.] Uffen. Yes, Bob Uffen. That was one of Louis’s invitations also. He came here one summer and I said I knew something about quantum mechanics. I am not sure I really did. Bob had this problem and we worked on it together. Nothing really came out of that except a good friendship with Bob Uffen. It wasn’t until Gordon came that we really started to think about the core. I was appointed to the regular faculty in 1957. By then I had my own group. I was working well with students. A young postdoc came; I think it was Gordon who recruited him for me. He said, “I’ve seen this very smart guy who just got his Ph.D. at MIT. Would you be interested in him?” So I looked at what he had done and so [J.] Freeman Gilbert joined us as a postdoc here. Then Freeman had his own career to develop and later went off, first to either GSI or Texas Instruments and then he went to UC San Diego. He has done remarkable and wonderful things there. When you started to do your work in the physics of the core, were you aware of the international debates that had gone on a few years prior to that on the nature of the core? W. H. Ramsey’s work about the hypothesis that the core was composed of compressed silicates rather than iron, and the [W.] Kuhn-[A.] Rittman arguments about this? Yes, Gordon introduced me to those and we talked a lot about those. Birch [A. Francis Birch] had published his great paper on elasticity and constitution of the Earth’s interior. It was a monumental monolithic object. It is an incredible paper. Birch had come to the conclusion that the core was iron, but not quite. Together we took a look at the shock wave data which was just then appearing. We came to similar conclusions. We looked at the compressibility of the hydrogen — the Kuhn-Rittman argument — and Gordon introduced me to that and I was a participant in that kind of thing. But still, for me the major direction of my own work was the development of theoretical seismology as a major component of my career. Do you remember how people were reacting to the idea of Kuhn-Rittman and Ramsey? Did it gain much support in the U.S.? No, I don’t think it ever did. I had made contact with several of the people over at Caltech and notably Frank Press, who had arrived a little bit earlier than that at Caltech. I was very much interested in his work on surface waves. He had developed surface waves as an observational tool during the course of his work at Lamont [Geological Observatory] with Maurice Ewing. He had by then arrived as — I don’t know if he was the heir apparent or the heir — to Gutenberg’s direction of the Seismological Laboratory. I was determined to go for my first time to Europe and take a leave of absence in 1960. I applied and got an NSF senior post-doctoral fellowship in 1960. I thought this was a good time to switch careers. What led you to that? Oh, I don’t know. I thought that the field of theoretical seismology was getting enough momentum and maybe it was time to start looking at something else. Were you involved, by the way, in the preparations for the IGY [International Geophysical Year]? Never. Louis Slichter had been developing earth-tide studies and been working closely with Lucien LaCoste. He had adapted the LaCoste-Romberg [Arnold Romberg] Gravity Meter as a sensitive device for — Louis was developing the notion of making global measurements of earth-tide observations. He, in fact, sent one of my graduate students around the world in the IGY — it was Ed Kraut — to shepherd this gravity meter. Ed took this to different exotic places. I never was directly involved. You didn’t have a desire really to be involved in this? IGY was really focused heavily on global observations of various kinds and here I was a theoretician. What does theory have to do with this? You know theory isn’t really observing the Earth. So that’s to say that the theoreticians weren’t really on the whole involved in the IGY? That is an impression you have to have of — if you want to get my conclusion here — to jump to the bottom line of where I think we stand in seismology today, I think seismology may be much of geophysics. The academic discipline has changed dramatically from the days when it was the interface between physics and chemistry and mathematics, and so on. When geophysics grew in size… how does a discipline develop an identity? It has a journal. Now we have JGR [Journal of Geophysical Research]. We didn’t have JGR in the early days. When the discipline matured, students came into the field. Departments of geophysics had to be set up. In the seismology area the interests were linear; they were wave propagation studies, which I myself was interested in as a theoretician. The wave propagation was really, in the first place, a divergence from the mainstream of physics. Physics had gone into all sorts of problems involving — on the elementary particle side — going into very high energy objects, isolated objects, which wasn’t the continuum that the Earth was. On the solid state side, one was more interested in how many particles — what condensed matter physics is concerned with — interact with one another; the growth of collective and unusual behavior in collective phenomena with heavy dependence on quantum mechanics. Geophysics had developed, first of all, along classical lines. It diverged heavily from physics. I think to the disadvantage of geophysics, myself. In addition, these ideas of theory, of observation, have proved to be of extraordinary value in mapping the interior structure of a “non-X-rayable” object — the Earth. This is what geologists also do, with great skill, on the uppermost parts of the Earth. In fact, geophysics and geology are both pursuing parallel tracks in terms of constructing two- or three-dimensional maps of the Earth. The geophysicists are concerned largely with present-day structure — and to a certain extent with how it got to be that way but much more so concerned with identifying present-day structure, at least the seismologists are, and the geologists with telling us a lot about how the Earth evolved, at least with regard to the way we see interactions at the surface. So they were complementary, and what one found is that in the 1960s and in the 1970s one was developing departments of geology and geophysics, of Earth and planetary science — on this campus of Earth and Space Sciences. But in fact, geophysics itself set up strong barriers that didn’t permit it to interact with what had been the ursprung [origin] of its intellectual seed of prior decades. There were strong barriers erected mainly with physics, but to a certain extent with mathematics as well. I think, in my own case, I was a voice that resisted that, but a weak voice because the numbers in the field of seismology multiplied dramatically. That is a realization that I have come to in recent years. In 1960 a political change took place at UCLA as well. We in the Institute of Geophysics who had had this position of research privilege discovered that — it wasn’t a sudden discovery — it was increasingly difficult to get good graduate students to help us with our research. We are still a research organization in a university, and our function is the education of graduate students. Our students were getting degrees in the other departments. That was expected. But the students in the other departments didn’t know about us. We needed a forum. Was this problem accelerated by the development of San Diego and the groups that were down there? Did that play a role? I don’t think it really did. What we did was we encouraged a program of joint appointments with the academic departments on this campus. Effectively we split our appointments so we effectively doubled the number of people in the Institute with ladder positions; we went out and had joint ladder appointments with several of the departments. There were joint appointments with Geology. I had a joint appointment with Physics. I wager that I am one of the very few solid Earth geoscientists in a physics department in the United States. The only other one I know of, who has just retired, is John [H.] Reynolds at Berkeley. That is a very interesting observation. I would imagine that it was predominantly the theoreticians in geophysics who felt this barrier that was developing? This is your trip to Cambridge? This is my trip to Cambridge in 1960 — what he thought. Well, I thought I would like to get involved in an experimental program as a change of pace. He suggested, we discussed, and what developed was that I would embark on a program of observations. I had the idea that, with Frank’s encouragement because I knew very little about the subject, I would develop a program of installing long-period seismometers — the Press-Ewing seismometer — in an effort to do regional studies. The long-period seismometer that Frank and Maurice Ewing had developed was then coming into use in a selected number of observatories of the world. It wasn’t widespread yet. There were some at Lamont, some at Caltech, but not really widespread. The coverage and resolution was not broad? I got support for four of these instruments. I can’t remember if I got it from the Air Force possibly, because the Air Force was just then becoming involved in an underground nuclear detection program. It was before the installation of the World-Wide Standard [Seismographic] Network. I think I had Air Force support for buying these — I bought four long-period instruments and transported them to Europe and installed one in each of four cities around the Alps. That, as far as I know, was the first time that those instruments were considered to be at least moveable, if not portable, and used in a program of regional studies rather than in a program of observatory studies. The observatory mode is “wait for whatever wiggles come past your station and try to interpret it.” Here we installed them purposely, temporarily, and observed earthquakes from all over the world. When we had enough data we picked up our instruments and moved them somewhere else. In the later part of my sabbatical I installed the same instruments around the western basin of the Mediterranean Sea. Then we brought them home at the end. We actually had two regions. Papers came out. What were the major results? In the first place, we found an enormous low-velocity zone under the Alps. It was enormous in the sense that the velocity of shear waves under the Alps, at a depth of around 80 km — which is much shallower — was extraordinarily low. Yet, the only other discovery of a low-velocity channel, in the Canadian Shield, had given a velocity which was virtually no channel at all. The indentation in velocity, the velocity in the channel in the Canadian Shield as observed by Brune and Dorman [James N. Brune and H. James Dorman], had a velocity of about 4.5 km per second, and we had found a velocity of 4.1 or 4.15. It told us that the temperatures were extraordinarily high and that it was in a zone that there was great ferment going on in under the Alps. They had a modest route, not as deep as one would have expected. One found that there was an unusual structure under the Alps that we had not anticipated. We also found that, for my own purposes, there were important mathematical problems associated with these things. The whole issue of how earthquake surface waves travel in the presence of inhomogeneous structures — when the structures are changing — turned out to be a stimulus for long-term work. That is, up to that time — and in fact the interpretation of the Alps was done in that way — we had assumed that the Earth was laterally homogenous. That is one item. The other item is that I then began to worry, for the first time, about the inverse problem of geophysics. Questions of how one takes surface observations and turns them inside out to get Earth’s structure. The forward problem is straightforward. You postulate a structure. You operate on it with whatever the rules of mechanics are that govern the way waves travel from here to there, and you predict the observations. You make observations and they are similar but not identical with the prediction. Therefore, what was the actual structure that one should have used in the interior to get what one observed? What we found was that the problem is non-unique. There are many structures that will fit the observations. I saw the problem. I worked a little bit on it during my sabbatical at Cambridge. I showed in a simple exercise that it was non-unique. The people at Moscow in [Vladimir] Keilis-Borok’s laboratory — Gerver [M. L. Gerver] and Markushevich [Vladimir M. Markushevich] — had been working on this problem from the point of view of body waves, which I wasn’t really very much interested in. The observations on the Chilean earthquake of 1960 had just been published by the three groups: the Caltech, UCLA and Lamont groups, all back-to-back issues in the JGR. They were an important and landmark set of observations. I started to think about the inversion of the free oscillations, the inversion of surface wave data, how one could extend this to Earth structure. I was scooped. Backus and Gilbert did a superb job. Freeman Gilbert and George [E.] Backus at UCSD did an absolutely superb job. Their work has been the beacon, with modifications, but nevertheless they showed how to do it. They did it right and they showed how to do it. In the subsequent years with my students — the next generations of students — we started to look at a number of problems in seismology. Personally, near the end of my sabbatical, I came home to get married. I got married in 1961. The same lady who had been the secretary in the Institute of Geophysics, who had been needling me about getting my publications, had a daughter, and they invited a number of people over for a Christmas party in their home in 1957. I went as a young bachelor — not so young anymore, 32 years old — and I met this extremely attractive girl who was also a guest at the party. We then started going out together. After almost 3-1/2 years we were finally married. There were ups and downs in our relationship. We finally decided that was the thing to do and we did it. She is a marvelous person. Joanne. Her maiden name was Van Cleef, unfortunately not related to Van Cleef and Arpels but spelled the same way. We’ve tested the system and it doesn’t work. We don’t get free samples! No, we haven’t really. She had been a counselor for undergraduates here at UCLA. She has a degree — a Master’s — in psychology from Stanford. She had been in academic counseling here at UCLA. Has she stayed in that? Until our first child was born and then she devoted herself to the family and also has become more and more involved at an administrative level with UCLA-connected volunteer activities, including the UCLA Alumni Association scholarship program and an alumnae organization that raises scholarship funds. She is a UCLA graduate — she did her undergraduate work at UCLA. She has extraordinary management skills and is able to oversee programs — organize people volunteering for these programs. One program she is extremely involved in is a program called Design for Sharing, which brings the performing arts to underprivileged people in the Los Angeles community, mainly public school children, without regard to the part of the city they come from. Many of these people have never seen professional performing artists, haven’t seen dance or musical performance on the stage. When a musician or a dance team comes on the regular performing arts series to the campus, they pay them a little extra to stay on an extra day to offer a demonstration performance, in an interactive way, with an audience of over 1,000 children in a large auditorium. They also give free tickets to people in old-age homes or homes for unwed mothers, to the evening performances. There are the jobs of developing the money, developing the volunteers to do this, making contact with the Board of Education for the busing and with the artists. It is an enterprise. She is extremely talented. One other thing that I wanted to ask you about is that in the late 1950s you became a member of the Earth Science Panel of the NSF in 1959. What recollections do you have of your time there? It was hard work, as I think most of my colleagues would say who have been in this field in that business. Everyone writes a proposal to the NSF in the hope of getting some funding from it. We had this big package of proposals to read and all the referees’ reports. Who else was with you on this? The panel had Bill Benson [William E. Benson], who was the chief of the NSF Earth Sciences division, who was program manager. He brought in Roy [E.] Hanson, later Program Director for Geophysics. Did you notice that Roy Hanson just died? I just saw it in the obit page of Eos [American Geophysical Union journal]. Roy handled at that time geology, geophysics, and geochemistry, and I think large chunks of oceanography were in there, too. I think the panels have now been dramatically split. Julian [R.] Goldsmith was on it. Bob Sharp [Robert P. Sharp] was our chairman for one year. Francis [J.] Pettijohn, I remember, was on it. I can’t tell you who some of the others were. I am probably doing them a disservice by not remembering their names. That can be added on later. It was fun because it was interactive. I learned a lot just by exposure to my colleagues. I can imagine. Were there any guiding principles that were used to decide among the proposals that you received at the time? Do you remember how, anything in general about the way in which, decisions were being made about the proposals? I have the feeling that the discussions centered almost completely on the merit of the proposals. Of course we looked at the referees’ reports significantly, but Benson and Hanson had the wisdom to select the referees. They did well. I don’t think there was a heavy amount — I don’t get the impression that there was a heavy amount — of playing favorites or politicking or whatever. Was the majority theoretical or experimental — predominantly experimental? Yes, very much so. There were very few theoreticians. Did you feel satisfied with the level of support you were getting from the NSF in those years? In those years I didn’t get any support because we weren’t eligible. That was a leading question? I am just kidding. For those three years, we were forbidden to apply, of course. Well, in comparison with recent times, the answer is those were halcyon days. But in proportion to all the science fields, did you feel that geophysics was being effectively supported by the NSF? Do you remember any discussions about this? My impression is that no one is ever satisfied, but I think that it was well handled and well supported. I think there has been a shift in attitude in more recent years. You’ve probably heard from many sides, questions of large consortia, and just that the price runs up. One impression I have is that the panel at that time was able to recommend and that the staff was able to implement that that division take a certain percentage of flyers of slightly wilder and less tested ideas. It wasn’t always the case, but there were always one or two per panel meeting that said “If we’ve got the money, why don’t we try this one out?” My feeling is that in recent years there has been a heavy, heavy focus on a conservatism of willingness to support and that tends to focus, generally, on a more averaged, perhaps more mediocre, level of product. There is no guarantee that flyers will lead to success, but I think there was a greater willingness on experimentation on the part of the NSF, at least in that division. I wonder if you feel that we have covered sufficiently the results of the work that you did with Gordon MacDonald prior to the time that you went to Cambridge and shifted your research? I am happy with that. In retrospect, it wasn’t a major part of my career. I see my own career as having three major episodes, merging into one another. The three episodes were first the theoretical seismology, the second the surface wave work. It started off as a program in observation and it led to some interesting theory. The third is what I have been doing for the last decade plus and that is questions of clustering of earthquakes, the earthquake focus and seismicity. About personal life. We were married in 1961. My mother died six months after we were married. In 1962 I was recruited to go to Caltech, and Frank Press and Bob Sharp knew my work. Bob was the chair of the division and Frank was the head of the Seismo Lab. I had a good relationship with them. They were recruiting me heavily in the spring of 1961. In fact, before I was married — are you in the mood for an anecdote? It may be an extended anecdote, so bear with me. Along about 1957 or so, George Kennedy came into my lab and told me about thermoluminescence. George had been collecting pre-Columbian pottery for a long time and had a vigorous relationship with art dealers who were selling the stuff. He was very much interested in identifying authentic from fake pottery. He had heard about thermoluminescence. The general idea is you grind up a potsherd that had been fired — to fusion — and you put the material on a hot surface and a certain amount of light is emitted. The light is trapped in the interstices of the crystal structure — in dislocations in the crystal structure — because of bombardment of the crystal structure by the trace radioactive materials in the clay. Everything has trace amounts. As the decay particles ricochet through the crystal structure they knock loose electrons, which lodge in trapped states in the crystalline material and this can be released by heating. The older the pot since firing, the more the bombardment, and therefore the more the accumulation. George had the original idea. I built the electronics; I had the following idea. He measured the entrance of radioactivity and I had the idea of — once the pot had been discharged and its glow measured — I then had the idea of bombarding it in an accelerator. At that time we had a cyclotron on the campus and we bombarded for a known dose, and we repeated the process and thereby got a calibration. I was responsible for the calibration and we gave a paper before the AAAS [American Association for the Advancement of Science] meeting in Chicago in 1957 or 1958, somewhere in there, and a lot of labs picked up on it. Pennsylvania developed a laboratory. We never really did very much with it. I’d lost interest in the subject once I’d done that. I went on my leave to England and I gave a talk on the method before the archaeologists at Cambridge and Oxford. At Oxford they picked up on the subject. Present in the audience was a man who was a reader in ancient Semitic languages at Manchester, by the name of John Marco Allegro. He wrote a book called The Treasure of the Copper Scroll. Allegro was much involved in the decoding of the Dead Sea Scrolls and an expert in Aramaic. But he was somewhat of a promoter — more than somewhat — and he was organizing an expedition to the Dead Sea to find more Dead Sea Scrolls. He had promoted tickets on Middle East Airlines, operating out of Beirut. The BBC and the London Sunday Times (not The Times) were sponsors, and Bachelor’s Foods was supplying dehydrated foods for our expedition. The BBC and the London Times had just sponsored [Edmund] Hillary to Everest. He said, “Have you ever been on an archeological expedition?” I said, “No” and he said, “Well, why don’t you come?” So I had nothing to do that Christmas time — except go back to Los Angeles and get married the following February — and I went off to Jordan. I took a gravity meter with me and we measured a gravity profile across the Dead Sea Rift, the only gravity profile before or since across the Dead Sea Rift. We went from Jerusalem — which was then in Jordan’s hands because it was before the Six-Day War — across to Aman on two different tracks. I rode on a Jordan gun boat. Can you imagine a Jew riding on a Jordan gun boat? That must have felt odd. Since I was a mountain climber, I climbed the cliffs of the Judean hills as they drop down into the Dead Sea. I then went across the border into Israel. I gave lectures on geophysics. I also gave a lecture in the Institute of Archaeology of the Hebrew University up in Jerusalem. Yigael Yadin was then the director of that Institute. He had just then discovered Ein Gedi, but had not yet discovered Masada. He had been the Chief of Staff of the Israeli Army but then had become a professor of archaeology. He was a very brilliant scholar. I gave a lecture to the crowd — everyone in Israel is an amateur archaeologist. They dig on Saturday. I brought back with me potsherds from the caves in Ein Gedi, which were accurately dated because there was a Jewish military force that had been trapped by the Romans — much like at Masada — and they had all committed suicide. The pottery was known to be dated from the year 133 A.D., which was the second Jewish rebellion against the Romans. I brought back with me cloth from the cave, also accurately dated. This was utilitarian material. It wasn’t art objects that might date from some earlier time. The cloth I gave to Eric [H.] Willis at Cambridge, who did radiocarbon on it. It provided an important benchmark on the radiocarbon story because there has always been uncertainty about fluctuations in the Earth’s magnetic field — whether or not we are producing carbon-14 in the atmosphere at a uniform rate. The pots I brought home, but in the course of having been in the Middle East I contracted infectious hepatitis. I was very sick. I came down with it in Cambridge, having got that far, and the upshot was that I spent my wedding night at a hospital in Cambridge, my wedding having been postponed. I came home to recuperate. I had a serious bout of it. It was about three months out of my year’s leave of absence. My bride-to-be nursed me. While I was in Los Angeles being nursed back to better health, Bob Sharp kept calling on the telephone recruiting me. That is how I recollect the time. In 1962 I was persuaded. Louis Slichter was trying to persuade me to stay here and Bob Sharp was trying to persuade me, and I thought, “Well, it’s time for a change.” I went over there [Caltech] and I was at the Seismo Lab. It was a good time. Gutenberg and Benioff and Press were all there; it was vibrant. A lot of things were going on. Gutenberg and Benioff were getting near retirement, weren’t they? Gutenberg had retired. Benioff was close to it but I don’t think had been retired. Charlie [Charles F.] Richter was there. It was a jumping place and I wanted to be part of the seismological scene rather than being the isolated individual here. When I got there I discovered that it didn’t work. I stayed there one year and then I told them I was going back to UCLA. It didn’t work because I wanted more physics, as it turned out, than I was getting there. I was involved in the Division of Earth Sciences and that’s not what I wanted. And, I needed a university. I didn’t need an institute of technology. Your interests were already very broad? They were broad. I needed music and not just the ability to go to concerts. I wanted to work in music. But I wanted to be in a place where there was a lot going on in English, history, economics, and medicine. I just wanted to hear these things. So I came back. I was elected to the National Academy in 1963 while at Caltech. Of course I had friends at both places and whatever I did I was going to disappoint some of them. What research did you work on during that year at Caltech? I worked very heavily on the interpretation of the surface wave data that I had gathered in Europe. I started to work on being at Caltech. I got inspired by the problems of earthquake statistics. That’s led to what I have been doing most recently. I became very much interested in the more or less intuitive way that seismologists were starting to approach their problems of cataloging earthquakes. How do you know when an earthquake is an aftershock and when it is not an aftershock? When is it an independent event? How do you know how earthquakes are connected to one another? So I started looking at earthquake statistics. I wrote my first paper in 1964 and I have been doing that more or less ever since. I wouldn’t have done that if I hadn’t been there and seen what the great names in that field were doing. What Charlie Richter was doing to develop the idea of earthquake magnitudes. What Hugo Benioff was thinking of in terms of — these are very, very brilliant people. I thought I could develop a contribution there. I was working on theories of surface waves and on the problems of inversion. That’s what it was. It was a year away, and it wasn’t really going to be that much different if I moved across town to the other side here. I still did the same thing. I think the major inspiration I got there was the idea of looking at the statistical side of earthquake occurrence. In retrospect, again, something that I have come to realize only in the last few years is that there is a big difference between the users of earthquake waves and the people who worry about earthquakes. There is a slight parallel. In medicine the radiologists x-ray the interior structure of the body, just as the seismologist uses earthquake waves to observe the shadows cast by the interior structure. We don’t have bones or things like that, but nevertheless the seismologist looks at shadows cast. The radiologist accepts the existence of x-rays but if the radiologist thinks, “I want to go to a softer x-ray” or “go to a different dosage” then he goes to the medical technologist — in our case the physicist — who says [pause] [Resumes after pause.] I think we were talking about my needs for diversity. About this time I started to develop a strong academic involvement in music. I’ve never really left the world of music. I wasn’t doing much as an undergraduate. I had stopped taking piano lessons when I started college. I played piano from time to time. When I was a graduate student — and for a year or so I lived on the Caltech campus — an undergraduate and I found we had both taken piano lessons when we were teenagers. So, we decided to have some fun and just see if we could play one piano, four hands. There were pianos around. I discovered that that was a lot of fun. This other fellow was good and I was pretty good. We could enjoy ourselves. We just picked up wherever we could find four-hand music. Then when I went away to Miami, several of the unmarried faculty members used to eat together and one of the members of our dining association was a man in the Music Department. He asked me to give a… We did two things. One is he asked me to give a course on musical acoustics, which I knew nothing about but at the level of music students it wasn’t something that any reasonable physicist couldn’t attack. The other was he and I started a two-piano team. We started to attack really difficult pieces and ultimately played before his classes. We played on the radio — local radio — and it kept my music interests alive. I even moved a piano into my rented room over Mrs. Stewart’s garage. Mrs. Stewart was a member of the DAR in southern Ohio. That is a conservative bastion. Yes. Anyhow, my return to UCLA…In fact in those days before 1954… I didn’t mention that I did have self-doubts whether or not… where I was going… before those first papers started to come out (1954-56 or thereabouts). I went over to a colleague in the Music Department here to whom I had been introduced by this chap at Miami. Who knew of him here? The chap at Miami had actually been on the faculty here at UCLA prior to that. I went over to my colleague here in music and I started to explore, “What are the possibilities of getting a degree in music?” Nothing ever came of it, but I became interested in the problems of the creative process in music and the problems of the analytical process in music and if it would be possible to systematize analysis. I took courses in music, formal courses in theory and composition. Not very deeply, but I took a course in orchestration; things that I had never really learned. In the early 1960s when I returned here, UCLA had formed an Institute of Ethnomusicology and brought in as its director a man by the name of Mantle Hood, who was quite an organizer. He had managerial skills, too. He developed a program in which there were a large number of graduate students and three or four faculty who were interested in understanding whether or not there were universals in music. Almost all music is taught as music of the Western world rather than the fact there are many cultures that have their own indigenous music. I became very much involved in that, just listening, listening. For political reasons that aren’t important here, the University and Mantle Hood separated. In recent times I have become very much concerned not with musical acoustics, which has been the subject of my seminar over in the Music Department, per se. Acoustics, according to the dictionary, has something to do with hearing, from the ancient Greek. I view acoustics as the hearing of music, rather than the things that are usually taught, which are overtone structure, production of sounds, stretched strings, scales, and that sort of thing. I’ve become very much concerned about and interested in the psychological perception of music. My colleague Bill [William R.] Hutchinson in the Music Department and I write a paper every year-and-a-half or two years on the subject of psychological perception, questions of how the culture organizes the available sound into language. Our ultimate goal, which we haven’t achieved, is how is it that you turn on the radio and you can say in an instant “that’s rock, that’s Beethoven, that’s Japanese, that’s German”? How do you do it? You don’t do it from the content. You do it from knowing certain mileposts, certain paradigms, certain basics. You have to have been exposed to it. Which is the basis of a paradigm? Which is the very basis of how we all learn language. We don’t learn language, we don’t learn English, as a set of formal rules. We learn it just by embedding in it… we learn music that way. The Japanese child learns a different music than we learn just because of being embedded in it. The idea of paradigm is important, as in sense perception and sight? We don’t know the details of the process but that’s something we’ve been concerned with. You became a research musicologist in 1961? I guess somewhere in there. That was to give me official status in the Institute of Ethnomusicology. What percentage of your time do you think you spend in that work? Oh, I don’t know. It’s a variable feast. I’d say… 10%? It’s not trivial but it’s not the whole part of my life. It’s an important part of my life. I am curious if there is anything, in reflecting about it, you feel that you took from your music studies back into geophysics? Is there something you gained from that which has been helpful in your other work? That is a difficult one. I am not sure that I could answer that. I am sure there is an overlap but I can’t put my finger on it. In 1973 as an adventure we went for a North American summer to Chile, the whole family. In 1966 we went to Germany. Karlsruhe. We’d come in contact with Stephan Mueller who had been a graduate student, or recent postdoc, at Stuttgart and he had been instrumental in helping us get our Alpine studies going. He was actually a co-author on the paper that summarized our Alpine work. He was then invited to become professor at Karlsruhe and he was forming an Institute of Geophysics. It was time for a sabbatical leave and we went off to Karlsruhe. Stephan’s agenda was focused on explosion seismology, which wasn’t quite my interest, but I found it useful because I could take the time to learn a little bit about computing which I was unable to do before then. I was able to work on some surface wave problems that still needed development. I was beginning to explore the interface between surface waves and free oscillations, which was a subject starting to take form. During the time that you were at Karlsruhe did you notice any particular differences between the organization of German geophysics and American geophysics, say the training of people who were in Germany? I gave some lectures at Karlsruhe and the audience was a passive audience. They were absorbers. They were not willing to engage in a dialogue. The German geophysics of the time was heavily focused toward crustal geophysics. It still is. It is a style that has developed, and I think that their style has been too narrow. I don’t know. They had a great observatory seismologist named Professor Wilhelm Hiller, but I don’t know the answer to that. I would suspect there is a strong influence of the Deutsche Forschungsgemeinschaft — the German NSF — on this but there was a very, very broad population of people who were doing a similar kind of work: Many institutions in Germany were setting off explosions and observing them with arrays and interpreting the data for crustal structure. I am not quite sure that I understand why. The students were going out and populating in the next generation a similar kind of work. Yes. Stephan Mueller — who then moved to Zurich — and Karl Fuchs have been very, very strong influences on that kind of work. They’ve done outstanding jobs in that kind of work. The style isn’t one that suits me personally. There wasn’t enough interest in the problems of rigorous inversion of the observations in terms of Earth structure. Karl Fuchs has made an important contribution to the theory on the problems of synthesis, developing synthetic seismograms, and it is a direction that a number of groups have gone to. It is not the direction we went to. I had a very unusual theoretician working with me by the name of Fred Schwab. You may have seen his name on several things. He has pursued the idea of doing synthetic seismology from the point of view not of doing ray tracing but of looking at the global structure and from the point of view of looking at syntheses of surface waves. They are known to be a complementary set. He hasn’t been able to develop a large following, but he has developed some following: Giuliano Panza, who came here as a postdoc from Bologna and is now a professor at Trieste; Edgar Kausel, who came from Santiago; Jose Frez, who is at this moment in Ensenada. These people have become attuned to this kind of enterprise that Fred has pursued for his entire career. They are doing some very remarkable work on synthesis of surface waves to give body wave pictures. Let me show you a picture. Look here. These are seismograms developed by Giuliano Panza and his postdoc Peter Sudaholc. He is able to develop…here are synthetic seismograms with very complex structure. When one compares these with observations, they are similarly complex wiggles. These are synthetic accelerations, for example, whereas the synthetics, by looking at body wave methods, they tend to be rather simpler in structure. The wiggles aren’t as complicated as one observes in the real Earth. I must say, the computational methods that Schwab has devised are considerably more intricate. They are very much more evolved. The speed with which you can develop these seismograms — that was another outgrowth. The question of whether or not we could develop a program in seismogram synthesis from what we had learned about surface waves was a strong ingredient of our work in the late 1960s. Earlier than that you were already working in the Upper Mantle Project? We can check on that. I guess he was the outgoing president. Beloussov, I see, at the time was the Chairman of the Soviet Geophysical Committee. He was extremely vigorous in trying to open Soviet geophysics to international interaction. Whereas, during the Stalin years it had become extremely compartmentalized. Soviet scientists were a great curiosity at international meetings. But you really didn’t have a clear sense of what work these people were doing? They appeared in 1957 at Toronto and there was some work in the IGY — we didn’t quite know what was going on. In 1960 Beloussov proposed the Upper Mantle Project. Of course he was unanimously elected Chairman of the Upper Mantle Project [in 1963]. This was to be a program of international participation and of our national committees who were concerned with international participations. There was a lot of bureaucratic structure in Washington that is concerned with our membership in this and that international organization, and they approached me if I would not become the Secretary General of the program to act as a counterweight to Beloussov and the Soviet participation, because the U.S. had to have a presence, of course! The answer is “yes.” I had all along reservations but I think, partly because of my service on the NSF panel of three to six years earlier, I felt, as one of my colleagues put it more bluntly, I should pay my dues. I think I felt at the time that I should be doing something not only for my own benefit but also I should be putting in some time in the service of my colleagues. This was as good a one as any. I didn’t realize, at the time, how demanding it would be. I decided to take it on under one condition that I put to the people in Washington — notably Merle Tuve, who was the Chairman of the Geophysical Research Board at the time, which was an agency through the National Academy of Sciences substructure — and I said that I needed somebody to act as my executive assistant. They promptly agreed. That was Dr. Pembroke J. Hart. Without Pem Hart it would have been a disaster. Pem knows how to organize a program. The Chairman was not going to organize the program. The Secretary General was going to organize the program. Without Pem this Secretary General could not have organized the program. Our Academy machinery had all the international contacts. Through Pem we organized a committee in every country of significance in the world. We interacted with the other unions. We interacted with ICSU [International Council of Scientific Unions]. We developed the substructure of the committees who were the working groups who were going to do the work in the international Upper Mantle Project, and how we were going to get the actual working scientists to communicate. We put it to the PSAC [President’s Scientific Advisory Committee], in the office of the President, that this was a worthy international endeavor. We were quizzed carefully by PSAC. We got a presidential endorsement from President Johnson. You were delegated to write the response to that? I spoke the reply. I read the telegram from President Johnson at an AGU meeting and then I gave the official response of the Upper Mantle Committee. The function was not only to have directed research. We were able to get — not a line item in the NSF budget — but certainly we had an increment in the NSF budget. The NSF people agreed that this would be still subject to the usual review procedures, but nevertheless focused on Upper Mantle problems. At that time, the funding was literally doubled in the Earth sciences. These days picayune, but I think it went from $2 to $4 million a year or $3 to $6 million, or something like this. Did money also come in from any other federal groups? Yes. There was an inter-agency committee and the other agencies; the Air Force — AFOSR [Air Force Office of Scientific Research] — through its work on the Vela Program. This was work which was structural seismology. That was extraordinarily valuable. The ONR [Office of Naval Research] was helping out on the issues of oceanographic work. The other agencies did contribute significantly. Without one person — Pem Hart — this thing would not have flown, as far as I am concerned. I quickly resolved that this was not going to be a 40-hour-a-week position with me. It was going to be a small part of my life — not insignificant — but it was not going to be the major part of my life. I still had my students. I still had my teaching and that was going to be the major part of my life. Pem Hart is superb — he himself has a Ph.D. from Harvard. He did work on crustal seismology with the Carnegie [Institution of Washington]; I think that was his actual experimental venue. No, the department of DTM [Department of Terrestrial Magnetism], with Merle Tuve. That was the connection. After Pem got his Ph.D. I think he went directly to work for the Geophysics Research Board of which Merle was the chair. Merle was extremely supportive. The Geophysics Research Board was extraordinarily supportive in opening doors, setting machinery into motion, giving us resources. I don’t know if I am supposed to tell stories out of school, but most of the resources for the international program came from the fact that we had a national program. All of this activity on the international scene had no budget. We had a modest budget from ICSU and all of those international agencies but that was not going to pay for the Secretariat. There was a small amount from IUGG which couldn’t pay a tenth of Pem’s salary. He was spending a large part of his time. He had a secretary and do you see those yellow things in that shelf over there? Those were coming out frequently? Those were coming out frequently. I have saved those few as a souvenir. I have been throwing away most of them myself. I have been cleaning house lately. Of course there was military interest in the Atomic Test Ban Treaty that was coming up at that time. The problems of the detection of underground nuclear explosions — the university contribution to that — was made through AFOSR, through the Vela program. I think most people saw that as a peacetime exercise of their intellectual skills. It was in the promotion of peace rather than of the development of weapons, which I suppose would be mainly classified in character. I don’t know how much was classified, but everything that we did was not only to do the science but to develop this extraordinary amount of conversation, of communication that went on between all the countries. Especially our interest was in developing communication with the Iron Curtain countries. That had been a closed door to us for so long. Did you find, when you communicated with your colleagues in the Soviet Union, that very different ideas had evolved on major issues in seismology? How different did you find the practice and the ideas of the Soviets? Their funding was totally different than ours. Their work was taking place through the institutes of the Academy of Sciences. They had much greater leverage, and I wanted very much to see the programs develop along the lines of what I could do here, along American lines, which was to declare that this program was one of national interest in the United States. I wanted to see something similar take place along those lines in the Soviet Union but it didn’t work. They knew what they could do and they weren’t about to change that because I came up and suggested something different. We learned to live with it and I learned a lot about the way the Soviet system works. A propos of all that, I have to remark on my interactions with Keilis-Borok. I’d like to hear about that. I first met Keilis-Borok at the IUGG meeting in Toronto in 1957. I think there was sort of an instant affection for one another. I think we were thinking parallel science and we had very strong background that was similar. He was a man with extraordinary breadth — breadth of interest in an unbelievably large number of fields — with contacts in the arts and in the sciences. He was a marvelous individual. He did not come to Helsinki in 1960. He came to Berkeley in 1963. By 1963 Stalin had died. Khrushchev was in power. I will give you a personal anecdote again. My father had died in 1946. He had come from a family of five siblings. One brother was alive in Leningrad and one sister in Montreal. The brother in Leningrad had written a letter to my father in Yiddish, which I speak, read, and write. It was my first language until the age of 5-1/2 when I went off to kindergarten. That is when I learned English. From that time on until I started taking piano lessons, I went to a secular school of Yiddish after school hours. I learned grammar, composition, and did a lot of reading. No, anti-religious. Part of the socialist labor movement, these were all people who were suddenly free of the parental constraints that forced them to learn all of this religious stuff. I think there was a large number of teenagers who came to this country who suddenly felt, “I am my own master, why do I have to do those things that we were obliged to?” You know, in a very prescribed way. But there was a great sympathy for the underdog, the working class, because they were themselves members of this working class. They saw that through organization there was a way to improve their life more than individually. So, they became members of a Jewish fragment of the labor movement that was in fact anti-religious. I don’t think in many cases they were even neutral about the subject. I think, in some sense, they wanted to be their own masters. They served the masters of industry, but they didn’t want somebody — any more than necessary — telling them what they could do and what they couldn’t do. Someone who is, in fact, supposedly their intermediary to someone even superior to them. So that’s the way it developed, and I was brought up in a non-religious household. My father died shortly after the war and then the Stalin terror descended on Russia and there was no more communication with this uncle. All I had was a letter with the address. In 1963 I asked Keilis-Borok if he wouldn’t… There was an agency in Russia to locate displaced persons. There was such an agency set up by the Russian government, but Keilis-Borok took the address, the name, and went to the address. He made a trip to Leningrad from Moscow and went personally to the address. My uncle’s — I don’t know if I am supposed to say this or not but you can decide whether or not to include it — daughter, whom I have never met, was living at the address. She gave Keilis-Borok my uncle’s new address. My uncle’s daughter — she works in war industry, and it would be very serious if she were to have any contact with Americans. So, I have never met her. Yes. Anyhow, that was the time of the IUGG meeting, which must have been August. By three months — early November, I should think — there was a letter on my desk from Uncle Vladimir — Uncle Volodya — in Leningrad written in Yiddish. Do you still find it easy to read? It is amazing how quickly it comes back. So I wrote him a letter back in Yiddish and I hadn’t practiced it since 9 1/2. My handwriting has not developed since the age of 9 1/2. Let me ask you what your handwriting in the English language was like at that age—it was a childish scrawl. How many of your teachers spent time trying to improve your penmanship? My writing of Yiddish today is that of a 9-year-old child. It has not progressed. I can see how adults write Yiddish and I can’t form the letters that way. I just cannot do it. I don’t have the muscular control or the mental control. So I wrote my uncle. Then in 1964 Keilis-Borok — we had ten working groups in the Upper Mantle Project and one of them, the working group on geophysical theory and computers, a strange mixture — Keilis-Borok was put in charge of that one. He was the Reporter for that one. It turned out to be the most vigorous of all of the ten groups. As one of the residues when the Upper Mantle Project finished, that group had so much momentum that it kept going with its annual (now biennial) meetings and we still have them to this day, of that group. We will have the next one in June in Israel. It is now called the Committee on Mathematical Geophysics but it is the same group. How large a role did you play in that particular period? I played a strong role, and Keilis-Borok leaned on me because he wanted to invoke — look, we put as much resources as we could to any of them but these people were the most vigorous so why dampen their ardor? The fact that I was more interested personally in that subject than any of the others was OK. I didn’t mind encouraging them. The first meeting of Geophysical Theory and Computers was held in Moscow and Leningrad. So we held the first few days of the session in Moscow and then we all moved en masse to Leningrad. You may guess why we have held meetings in Leningrad. I can guess. How was that? It was an emotional reunion. A man I had not met before, but it was an emotional time. The family had suffered, as many Jewish families had, at the hands of the Germans. The family had lived in a small village in White Russia. A fragment had moved to Leningrad before the Second World War; a fragment had stayed behind. The fragment that stayed behind disappeared from the face of the earth. It is a story that has been told many times. Of the fragment that had moved to Leningrad before the war, the men had been conscripted into the Russian army, which had suffered enormous casualties. The women stayed behind in the siege of Leningrad, which was terrible in itself. The city had a million deaths. Amazingly, of my family no one died except one extremely old man who was in his 90s or something like that, in the siege of Leningrad. The women survived. You wouldn’t like to hear the tales that they told me of what they ate! Would you like to say it? Well, the paste off the wallpaper, the rodents scurrying around in the woodwork. It is not pleasant but they survived. The men, the majority were killed in the war. My uncle survived. I used to speak with him and he was very bitter. He was trained as an engineer, working on those bridges — the railroad bridges that I never built. He had not escaped the Czar’s army that my father had. My father was to send for him when he had made enough money in the land of opportunity, but the curtain of the First World War descended and my uncle — who was my father’s junior by two years — was drafted and fought in the First World War. He then fought in the south in the Civil War against the White armies and the foreign armies — the Allies then invaded Russia. He fought in the south in Central Asia. Then a brief interval of 17 years or so and then was conscripted again into the Second World War. He fought not at Stalingrad but at Voronezh, which had the reputation of being a battle almost as difficult. He survived that. Somehow he was a survivor and there he was. That family gathered and it was an emotional time. I have been back many times since with Keilis-Borok’s help. Our careers have been parallel. When I wrote a paper on the energy release in earthquakes, which was a paper concerned with how much is the energy reduced when you introduce a crack into a stress solid, I was able to solve the problem analytically for a crack in the shape of a long strip. Keilis-Borok, at the same time, was working on the problem of a circular crack. I was working on the inverse problem; he was working on the inverse problem. I was working on surface waves; he was working on surface waves. I started to work on clustering of earthquakes; he started to work on clustering of earthquakes. These directions are almost independent. Sure, we talked about these things to one another but the fact is… and he has developed a far larger group of people than I have. One of his talents is that he has extraordinary contacts with the mathematical community in Russia. He knew Kolmogorov [Andrey Kolmogorov], Kantorovich [Leonid V. Kantorovich], Gelfand [Israil M. Gelfand], and now contacts with Sinai [Yakov G. Sinai]. I probably left somebody else out — Arnold [Vladimir I. Arnold]. Because of anti-Semitism the mathematicians, who are themselves Jewish and trained at the hands of great Jewish geniuses, can’t find jobs in Russia. Keilis-Borok collects them. This has brought his laboratory under some scrutiny because when you have a laboratory that is 2/3 Jewish in a country that has only 2% of the population that is Jewish…and so he has had a difficult time to promote survival. He is an outstanding scientist. I don’t know how much of this I should be putting in here because even today I still worry about his safety and his survivability. We can think about what access we want to allow. But I am being very frank with you. We [Keilis-Borok and I] have worried together about why the Jews have survived over the centuries, and we quickly (not so quickly) on top of Mt. San Antonio here discovered we had a parallel interest in mountaineering. We found that we were talking about survivability, on top of a mountain, and we came to the conclusion that they survived because they used their intellectual powers in a different way than the other elements of society did. Those people that didn’t have the intellectual powers perished. There was some process of natural selection. That is one ingredient. What were they surviving against? And that was the ability to find solutions to difficult problems and namely difficult problems of survival. How do you manage to find solutions where other societies were unable to? Why did the Hittites fall before the Egyptians? Why did Roman civilization decline? What was it? It was a very small fraction of the population but it seems to have a — and I don’t think it is the religion that keeps it going. There are other — well, Christianity is a much stronger religion than Judaism, by far. We related it to the ability to solve tough problems. You know, there is a large part of the population that can’t solve tough problems. Part of the Jewish population can’t solve tough problems. But that was what seemed to you to be the identity? Yes that’s right. That says to me, as a secularist, that this society is in danger of disappearing when anti-Semitism disappears from the face of the world. It is a reaction. The reaction to the adversity? We were talking a bit about drift theory in the United States before 1960. In the 1930s and 1940s, Dave Griggs was a strong supporter — well not 1930s because he was still a graduate student — but in the 1940s he was an extraordinarily strong proponent of convection in the mantle. Not continental drift but convection. He had done some critical laboratory experiments and he was vocal on the subject. I think the Rancho Santa Fe Conference that you have talked about was largely a vote of confidence for some of Dave Griggs’ ideas. This was just a shot in the arm to his view of the state of the Earth so I saw it; I think he was very enthusiastic and I think we all were. On the other hand, Beloussov himself has never, even to this day, acceded to the notion that there is sea-floor spreading, continental drift, mantle convection. Have you talked about that with him or any of his disciples? Do you understand why he has held to these views? He is a land geologist who doesn’t look significantly at the sea. I think the great clues for the mysteries of continental drift and sea-floor spreading were hidden in the record of the sea rather than in the land. The early picture, which many people pooh-poohed, that the continents somehow drifted apart by plowing through a resistive solid obstacle which behaved much as a sea does to a ship, may still be sticking in the minds of — I don’t want to put words in his mouth — but the land history is very, very much more complex. Beloussov, a land geologist, sees the history of vertical undulations in the continentals — the land continental surface — whereas the picture of large horizontal motions is at odds with a picture of vertical motions. The picture of large horizontal motions pictures the continents as more or less undeformable objects which are riding as rafts, as superstructures, in a larger chunk of territory, which itself includes sea floor. That is, that the discontinuity in the motion isn’t taking place at the continental edge in most cases, except around the margin of the Pacific. But, for example, on the east coast of the Atlantic there is a large piece of ocean that moves along with the continent. As part of the plate. Yes, I think that acceptance in Russia was slower because of Beloussov, but there is broad acceptance in Russia, too. He did have, of course, enormous influence in the 1960s. Were there others who had comparable influence in your estimation? In what regard? On the problems of sea-floor spreading or of evolution of the Earth? I can name the obvious great names. I think Ringwood [Alfred Edward “Ted” Ringwood] and Wasserburg [Gerald J. Wasserburg]. I’m sorry, I was speaking specifically of the Soviets. Oh, the Soviets. I don’t think that the Soviets ever produced anyone who had the impact of the drifters in England, France, and the United States. I don’t think they ever did. Yes, that was the question I had. MacDonald, in the early 1960s, was one who had believed that the Moho [Mohorovicic discontinuity] was not a change in the composition but rather was a solid phase change. Kennedy wrote on that subject. I wasn’t aware that MacDonald had said that. I was just wondering if you recall debates about that issue among the faculty? Bullard [Edward “Teddy” C. Bullard] and Griggs wrote a paper which was extremely damning and argued that if it were true under the continents, it couldn’t be true under the oceans or vice versa. Maybe I am saying it badly, but because the continental crust is very much thicker than the oceanic crust and because of the approximately equal heat flow between the two, you couldn’t find the stability of the transformation, couldn’t invoke the same sets of minerals in both cases because the slope of the phase transformation — dPdT, the Clapeyron slope — would have to be negative in that case. If the phase transition takes place on a curve with positive dPdT then it should take place at lower temperatures at the ocean Moho — and this doesn’t seem to be the case for the Earth. If it is a global phenomenon it won’t work. I don’t know if there are still people who think it is a local phenomenon exclusive to the oceans and not to the continents, and vice versa. I haven’t followed that story. Another development that I was interested in was the Space Science Center gravity studies begun here at UCLA about 1962. The gravity — the Earth tides — work of Louis Slichter was already in place when I arrived in 1950. Louis was doing that kind of work already at that time. Louis retired as Director of the Institute in (I think) 1962 and Bill Libby came into office. As the second Director. 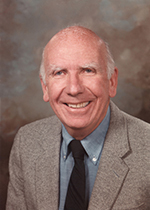 Bill had recently come to UCLA as Professor of Chemistry from his service on the AEC. He was a commissioner for the Atomic Energy Commission. He came to UCLA and then when the vacancy in the directorship opened up, he was appointed the Director of the Institute of Geophysics. Bill’s interests were not those of classical, so-called classical, geophysics. He wasn’t really a technical expert in the problems of solid Earth or the atmosphere or the oceans. He became extremely turned on by the opportunities that were just developing in space science. He used his influence and was able to obtain for the Institute of Geophysics — then called the Institute of Geophysics — an extraordinary amount of resources. Those resources were well-used, not only to promote research in space physics but also to start a program of graduate education in space science. They had a fellowship program and they invited students from all over the country. They started a degree program as well, which was extra-departmental because no department existed at the time. It was administered for a long time through a committee, and then the program got to be so large that they formed the Department of Geophysics [and Space Physics] out of this program, which had been wholly started by the Institute of Geophysics. Did you remember roughly when that had taken place? The Department was formed, I would say, around 1965-66-67 — somewhere in there. Gordon MacDonald was the associate director of the program and Bill Libby was director of the program. Gordon’s interests switched at that time toward the atmospheric sciences. He had already written his book with Walter [H.] Munk on the rotation of the earth — which is an outstanding book — and Gordon’s extraordinary breadth of interest became really obvious. He started off as an experimentalist geochemist at Harvard and went through… and was able to talk about the physics of the interior. He and I talked about attenuation and then he started to look at the problems of the atmospheres. I still see his name in the paper. You may have seen it just recently on this question of the global warming. He is looking at CO2 in the atmospheres and it is remarkable breadth that the man has. There was a long interval in which he was doing administrative things. How broadly did the Institute grow when these funds became available in the 1960s? Do you remember roughly what the sizes were at the beginning of that time? Bill Libby — I think with Gordon’s heavy influence — was able to bring a wide variety of scientists to broaden or complement our own activities at the time. Many of these names have since gone away. For example, Willem Malkus came here; George Wetherill came here. He is now at the Carnegie? George is the director of the DTM and Willem Malkus is at MIT in the Department of Mathematics. I don’t know if he still is, but was recently the Chair of the Department of Mathematics. Fritz Busse [Friedrich H. Busse], who is an extraordinary scientist. Were these permanent appointments at the Institute? Yes. If I were to say that the Institute is a diffuse set of 20 labs that would be incorrect. There is one coherent group that is very strong and that is the space science group today. At the present time. They have four senior observationalists: Chris Russell [Christopher T. Russell], Margy Kivelson [Margaret G. Kivelson], Bob McPherron [Robert L. McPherron], and Paul Coleman [Paul J. Coleman, Jr.]. Charlie Kennel [Charles F. Kennel] is a theorist, and Maha Abdalla does computational physics on space problems. They have a large number of postdocs and graduate students up there. It is a vibrant and exciting group. That is the fallout of Bill Libby and I think it was an extremely positive thing. In 1972 there was a review of the Institute by the Administration and it was recommended that the jobs of statewide director and director for the local campus be split. Bill took on the job of statewide director until his retirement, and I was appointed the third Director. That is a position I held for 14 years. When was it that you were first appointed? 1972 to 1986 was the interval. What sort of an administrator was Bill during the time he was the Director? Do you want the truth? Bill was authoritarian, no doubt about it. He was not at all delicate or diplomatic. I think an authoritarian approach doesn’t work well when you have a large number of prima donnas who are similarly inclined. It wasn’t a coherent group in his day. I don’t think he made any effort to introduce a colloquium into the Institute. He was a money-raiser par excellence and able to speak the language of science to benefactors, whether governmental or private. It was an easier time than it is at the present. Whereas, I told our Vice Chancellor, when we were talking about this job, that if they wanted a clone of Bill Libby, they had to look for somebody else. I was not a good money-getter but I would do my best to try to improve the esprit of the organization and that I would try to move it in somewhat different directions. I convened the Institute regularly to develop what I hoped would be a democratic sense of development of direction. We decided that if the hallmark of the Slichter days — 14 years of Slichter’s group — was the development of geophysics as a program for the Institute, and the hallmark of the Libby days was the development of space physics, that in these new days we should focus on new problems consistent with the mandate of the Institute, which was to explore the interdisciplinary space among the fields already present and established as academic disciplines in the University. By then Geophysics had been established as an academic discipline — as a department. It was later fused with Geology to form the Department of Earth and Space Sciences. This was after the time that your appointment began? That took place a few years after my appointment began. Was there much debate about that? Yes. The fusion of the two departments was at the instigation of the Administration, and the Administration sees all sorts of economic value to having the fusion of two small departments into one larger one, because you will have a few less machinists or a few less secretaries or a few less drafting people, or something. The support can be consolidated. I suppose you also get a more coherent picture of space needs for the department; in any case the department is larger and therefore has a stronger political position. It proved a difficulty for the Institute of Geophysics because at the time when joint appointments were being generated — just before fusion — we had appointments with Physics, Chemistry, Geology, Geophysics, and then when the fusion took place we had the overwhelming number of our joint appointments with one department — Earth and Space Sciences. That was a problem of my day as Director. Then we got into another image of how that department — Earth and Space Sciences — and the Institute of Geophysics interacted. If you have a sizeable fraction of the Department of Earth and Space Sciences members of this Institute, then you have already a class structure within the Department — some people who have to teach full time, some people who can spend half time on their teaching. Which introduces friction and animosity. But the Department saw us at the same time as a significant resource. We are a recruiting tool. If you can say to somebody that you want desperately to come to UCLA from the outside, “Look! we can give you an appointment where you only have to teach half-time compared to some of your colleagues,” that’s a nice perk. Was that in fact what you found worked well? And the Department of Earth and Space Sciences were the most vigorous in taking advantage of that. There was danger, however, that they were the ones who might call the shots for the Institute of Geophysics, that they would be the ones coming to the Institute of Geophysics saying “Here’s a guy we need in our program but you guys have to put up half of the salary.” So that became a rather narrow line and I worked very hard to try to broaden the interaction with the other departments, with not great success. What were some of the principal obstacles that limited your goals? Part of it is that the main threads of the Institute — the main directions of research — are most closely overlapping with the Department of Earth and Space Sciences. Whereas, there is not much overlap with Physics. We have three appointments with Physics. We have one with Mathematics. We have two with Chemistry. We have one with Atmospheric Sciences. There were zero with Atmospheric Sciences when I came in. There was only one with Physics when I came in. There was only one with Chemistry, if one didn’t count Bill Libby who had retired. I have tried to broaden it but it is a difficult route to follow. The other is that the Institute of Geophysics and Earth and Space Sciences sit in the same space, the same geographic space. I think those problems have largely been straightened up but for a long time there were problems of turf. Earth and Space Sciences has been seeing us as a competitor but also as a place of faculty enrichment and support. The other departments haven’t really made as much use of that as they might have. We decided on two directions: one perceived as a direction for the future long term just as geophysics had been perceived back in the 1940s as something to recommend. The other was a direction that we saw as an interface between astronomy and physics that wasn’t really being exploited as enthusiastically as it should — the second was astrophysics. The first was the origins and the evolution of life. In the astrophysics area I had promoted the appointment of Charlie Kennel who had been full time in physics and we took half of him away from physics. Charlie had made a great reputation in space plasma physics and he wanted to work on, and we encouraged him to work on, relativistic plasmas which are clearly mainstream to astrophysical problems. He did a very nice piece of research on showing that the Crab Nebula is a plasma shock wave — a relativistic shock. This is work in the late 1970s now? This would have been in the mid-1970s. Charlie has been pushed into several administrative roles so he hasn’t been, in recent years, a vigorous exponent of trying to… we were going to make resources available in the direction of astrophysics, but Charlie was not a vigorous spokesman for that. We hired a young astrophysicist from the Institute for Advanced Study by the name of Jonathan [I.] Katz, who left us and went to Washington University in St. Louis. We had a third person, Fritz Busse, who knows huge amounts about convection and origins of the magnetic field. We thought that he would be an extraordinarily good spokesman but Fritz is not a political individual and ultimately he too left with a very beautiful professorship in Germany. So our program was that we proposed appointment from the outside of someone who wanted to come in solar physics, which I thought would be just perfect for our special interest, especially because we have a big solar-terrestrial interaction group, but for reasons known only to the Administration, they vetoed it. This was to the great dismay of our Astronomy Department, as well as us. It was an emotionally difficult battle. We made four attempts and it didn’t go very far. And it’s led to continuing unhappiness, or at least I imagine that there is continuing unhappiness, about our relations with Astronomy because those things that we had promised to explore just haven’t come to pass and now it has just been dropped by the wayside. Origin and Evolution of Life, we had a very strong person by the name of Bill Schopf [J. William Schopf]. He has gone ahead as much as resources would allow, and we now have three faculty in that area. I suppose that modest statement is what I can put my finger on as the residue or the legacy of my tenure. That is good to have here on tape. I am wondering, when you came on to the directorship, did you have any conditions in mind that you had asked for before accepting the position? Were there any negotiations that you recall particularly about what you wanted to do? Well to a certain extent “yes” but I don’t think I was as… I think the fault that we didn’t follow through on them is as much mine as the Administration’s. I wanted an increase in support budget. I got some. We were promised an expansion in faculty size but we already had so many vacancies that they said they would only give us the promised expansion after we filled the vacancies. It took such a long time. I suppose it’s my inertia but I was only making one new appointment, at the most two, per year. Because of that inertia that opportunity dissipated ultimately and the promised appointments were withdrawn back to the University. At the present time we are essentially the same size we were when I came into office, which is, I suppose, just a reflection of my lack of vigor on this. We are officially nine and 2/3 FTE (full-time equivalents). I think we are officially something like 22 or 23 members with ladder positions because of joint appointments. I want to turn back quickly to the 1960s. Chandrasekhar had proposed a model of convective motion in 1961. It seemed similar to the work you were doing a number of years later. I wonder how much contact you had with him in the development of this. Hydrodynamic and Hydromagnetic Stability, as I am reading it off the shelf up there! Chandrasekhar, I believe, was interested in convective instabilities and stellar envelopes. He studied the Bénard problem from the linear point of view. He didn’t do very much with the nonlinear convection problem. I started looking at convection of the Earth’s mantle from the linear point of view again, which had been done before me. Then by the time I got to the nonlinear problem, which is far more interesting, I came under the influence of Malkus. The paper by Malkus and [George] Veronis was an important step function and growth of the problem. At that point I realized that if I wanted to go further I would have to essentially become a full time student of that subject. It wasn’t something that I was willing to do. To turn to another topic — also in the 1960s. The National Academy in 1965 had published the Sauder Geophysics Survey and Outlooks. What involvement did you have in that? As I recall I was one of the members of the drafting team. I believe that’s right. What do you recall of debates about what the appropriate future seemed to be? Literally I don’t remember. The reason I don’t remember was because we were drafting the proposal for the Upper Mantle Project at about the same time. I was the chair of the drafting committee because I was going to be the chair of the U.S. National Committee. That had greater significance for me at the time. It was of greater importance for me, partly because the drafting committee for the Upper Mantle proposal was small, and the drafting committee for the Geophysics Survey was an extraordinarily large group as I recall. It was a huge group. As we mentioned, what we’d like to do is save the work that you have done on the frequency of earthquakes until a later interview, when a little bit more time has passed. What I did want to ask is, thinking back over what we’ve talked about so far, are there any other issues or parts of your scientific work that we haven’t discussed that you would like to? I don’t think so. Can I refer a little bit to this most recent episode, though? I won’t talk about my own work but I would rather take a look at the national program in earthquake prediction if I might. That does concern me and I think my work on nonlinear seismicity does enter into this but we are agreed — we won’t talk about that. We already talked about the fact that geophysics and physics diverged a long time ago — 40 or more years ago — mainly because of the involvement of geophysics with linear physics, with the wave equation. If you want to take the medical analogy and go back to the construction of soft x-rays, then the radiologist goes to the physicist and says, “Change the nature of the source. Since you know so much about bremsstrahlung,” or something like this, “tell me about what happens if you change the source from copper to some other ore?” The same is true with earthquakes. The seismic waves, as we have already said, cast shadows of the Earth’s structure. But what about the nature of the earthquakes themselves? In my opinion the management of the earthquake prediction program was put in the wrong hands. What period are you thinking about now? I am talking about the time when Frank Press wrote his report. This is back in the early 1970s. The history of the U.S. involvement in earthquake prediction goes back to reports that were written for various study groups — late 1960s I guess, early 1970s — whether or not earthquake prediction is feasible and should we be involved. At the 1971 IUGG I think it was, Frank and I were taken aside by one of the Soviet scientists — I have forgotten who, maybe Keilis-Borok, maybe somebody else — and he said, “Would you like to go on a field trip to Garm in Tajikistan? And you’ll see wonderful scenery.” A lot of people were going on field trips hither and yon, so we went off to Garm. There had been a large earthquake in Tajikistan in 1949 with many people killed. That inspired the establishment of what they called an expedition, but in reality it was a large observatory with a permanent station and several hundred people there. They had been gathering data from 1949 to 1971 and they had been analyzing it. They brought Frank and me there, and they showed us the results of the analysis. They claimed that there was a strong change in the ratio of the P-wave and S-wave velocities of seismic waves in the focal zone prior to an earthquake. It was later shown that this was somewhat of an irrelevance or a red herring, but at the time it looked strong. This was compelling and they knew we would go home and say that this could be used as evidence that earthquake prediction was indeed possible. In 1971 also, earlier in the year, the San Fernando earthquake had occurred in February. After every large earthquake there is always an investigatory commission. As a consequence of these things, by 1975 the Cranston Bill had passed the Congress, both the enabling and the appropriations for an earthquake prediction program. For some reason the direction of the program was put in the hands of the U.S. Geological Survey. That act, that placement in the hands of the U.S. Geological Survey, tells you that somebody in the Administration saw the problem of earthquake prediction as a geological problem. I claim it is not a geological problem. It is a physics problem. The geologists are able to handle the problem descriptively. They can draw correlations. That is what they are trained to do. They are naturalists. The early naturalists were like Humboldt [Alexander von Humboldt]. Humboldt was trained to go into Africa — or Darwin would go into the Galapagos and tell you how many finches with yellow wings there were — and tell how many stripes on the zebra were there in Africa. I don’t intend to demean what the U.S. Geological Survey do or what geologists do in this regard, but their program has been, I would say, at the 95%-98% level phenomenological in the sense that it is data-gathering and it is correlations. Relatively few geophysicists, as I recall, were employed by the Geological Survey. They did have a group that was involved in crustal seismology. Many of that group went over into the earthquake prediction program. The U.S. Geological Survey embarked on both an in-house and an out-house funding program much like the NIH does. They carry on their own research and they also carried on a program of extramural funding, with all the hazards implicit in that. It should be a mission-oriented problem. It has been run, I think in large part, on a peer review system, which implies that they take the best proposals. If the best proposals are all in one area, you don’t get much of a broadly based mission. I think that the lack of progress that we’ve had in the last 15 years — since 1975 — is really due to the fact that the management has been in the wrong hands. I don’t know who would be the right people to do the management. I will interject a little bit of my own research now. If earthquakes occur randomly, there is no hope for prediction. That’s just a statement about the Poisson process. a) Do earthquakes cluster? Yes, they do cluster, because big earthquakes have aftershocks. That is a simple statement of clustering and therefore earthquakes cluster. The name of the game is how do they cluster and is there any perceptible or identifiable clustering that takes place before large earthquakes? Here is where the phenomenologist comes into play. Clustering doesn’t mean an excess of earthquakes; it might also mean a deficiency of earthquakes. That too is a cluster; an anti-cluster but a cluster. No one asks in this process “What is an earthquake?” To understand what is an earthquake and why one earthquake triggers another earthquake, which is what you mean by a causative relationship between one earthquake and another, you have to start to look at the physics of fracture. You have to start to look at what kinds of physics will lead to what kinds of clustering, and the process is nonlinear. There is my pet horse which I am flailing. The process is nonlinear because it involves clustering. If you have a dilute distribution of objects, they are non-interactive and you can attack the problem essentially in a linear way. If you have an interactive system you are talking about something other than radioactive decay now, in which each event is essentially independent. So the problem fails the geologists on two grounds: 1) no one asks what an earthquake is and how it can influence another one (which is a physics problem) and 2) the fact of nonlinearity which falls outside the academic skills of most geologists. I claim it is a failure that goes a long ways back. I don’t mean by geologists. I mean by Earth scientists who have been accustomed to a linear view of the universe. So you have applied this broadly to many departments of geology at the moment? Yes, yes. I’ll apply it to this one. Even the centers of geophysics? This Institute of Geophysics has something like six or seven people who are doing nonlinear science. Paul [H.] Roberts does questions of the origins of the Earth’s magnetic field and why it reverses. That is nonlinear magnetohydrodynamics. Bill Kaula [William M. Kaula] looks at questions of planetary accretion—how did the planets condense out of the solar system. Collisions are highly nonlinear. Ron Shreve [Ronald L. Shreve] looks at transport phenomena of dense matter in streams — fluvial geomorphology is the technical term, and glacier flow — nonlinear rheology. Charlie Kennel looks at shock waves in diffuse plasma, but nevertheless shock waves. Shock waves are nonlinear. I look at problems of fracture and disorder in fractured systems. Michael Ghil is an extremely powerful student of the problems of climate dynamics and global change. It happens to be a buzz word of this year. But nevertheless, he is an extraordinary, visible scientist in the problems of nonlinear dynamical systems. I think we have a lot going in this Institute. I can’t really take conscious credit for that. I didn’t plan it that way because I didn’t know that it was going to work out this way. In retrospect this turned out to be… I think we are a little bit farther along here than most other institutions at this time. I think that’s an interesting point you are raising. How many other institutes of geophysics at the moment have people who are working on the nonlinear side? Very few. Most of the advances in nonlinear science that have taken place in the last few years — look, there is an Institute for Nonlinear Science at Los Alamos, a center for nonlinear science, which is extraordinarily strong. But there is also a branch of the Institute of Geophysics and Planetary Physics there that doesn’t do this kind of thing. Do they have strong contact with one another? I don’t know that they do. I can’t be sure. Oh, I left out one other member of our Institute. Jerry [Gerald] Schubert, who does mantle convection. There are seven, I guess — Forgive me Jerry Schubert. I didn’t mean to slight you. Most of the advances in nonlinear science have been made by the fluid dynamicists who deal with the problems of turbulence. By and large, they have been more visible in departments of mathematics. There are some continuum mechanicists who are; I think very few are in geophysics. They may be in engineering groups but I think by and large, well look at the names. People like the Khuranas [spelling? ], for example. The whole group, a few years ago, in the Physics Department at Santa Cruz. The days of Packard [Norman H. Packard], Crutchfield [James P. Crutchfield], Guckenheimer [John M. Guckenheimer], Farmer [J. Doyne Farmer], Joe [Joseph A.] Rudnick; that was an extraordinarily powerful group but they’ve all gone away to other institutions now. [Harold] Liebowitz, Orszag [Steven A. Orszag], Malkus, Veronis, Lou Howard [Louis N. Howard] — but not many in geophysics. That takes us back to where we were this morning and that is the question of why geophysics moved in a linear direction. That is a very important point. I am glad you brought that up. I am hopeful that now physics departments are becoming interested in these nonlinear problems. I think it is a wonderful opportunity for geophysics to reestablish its credentials in physics departments, largely because all of these observations of instability appear in classical systems. All of these instabilities disappear thus far in quantum systems. Look at the papers of the work of Michael [V.] Berry in Bristol on quantum chaos. It is not there. This seems to be a property of classical systems so there is a renaissance taking place in many physics departments in the direction of classical physics. I see that geophysics, from just these seven areas that I have talked about here, is a superb laboratory. It is the place where nature shows itself as a set of target problems for the physicist — the nonlinear physicist — to attack. That same emphasis is coming in certain parts of climatology and meteorology. The meteorologists, starting with the Norwegian school, were always interested in PDEs — nonlinear PDEs but nevertheless PDEs. The issues of instabilities didn’t appear until Charney [Jule G. Charney] came on the scene. One looked always at PDEs as having some nice smooth properties. It is the dealing with singularities, with phase transformations, with irregular jumps in physical properties. I think it is an exciting time. Things are changing. Let me just show you one picture here. Let me just thank you again very much for this long session that we are now calling to an end. We will, of course, not make the tape available to anyone or its transcript without your express knowledge and approval as specified in the permission forms that we will be sending along to you. We thank you again very much. Please see leon.knopoff.com for more information about Prof. Knopoff. Photo above courtesy of Joanne Knopoff. Please click here to request her permission to use the photo.